For those who have been following my posts for the past few months, you'll not likely be surprised when I tell you that there was A LOT going on in this 5-day trip. 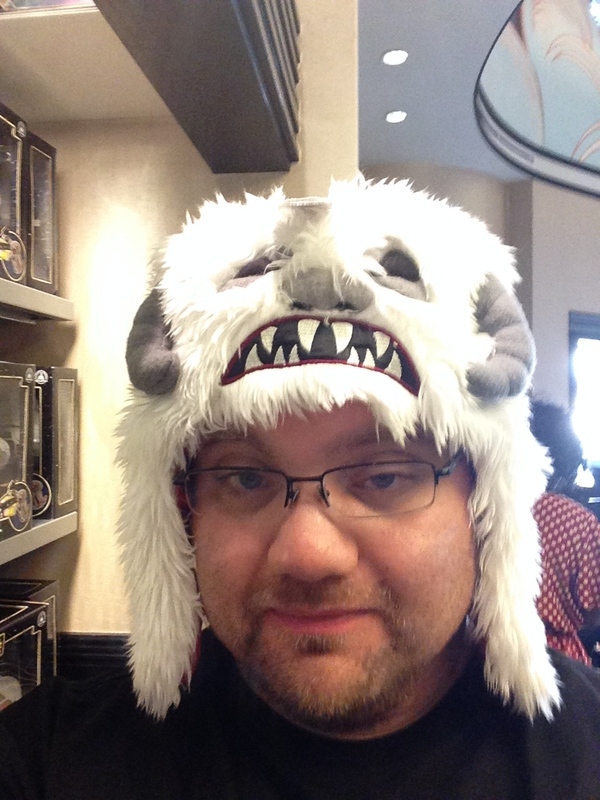 When we got our annual pass, I promised DH that one of the trips that we would take would be for Star Wars Weekend. 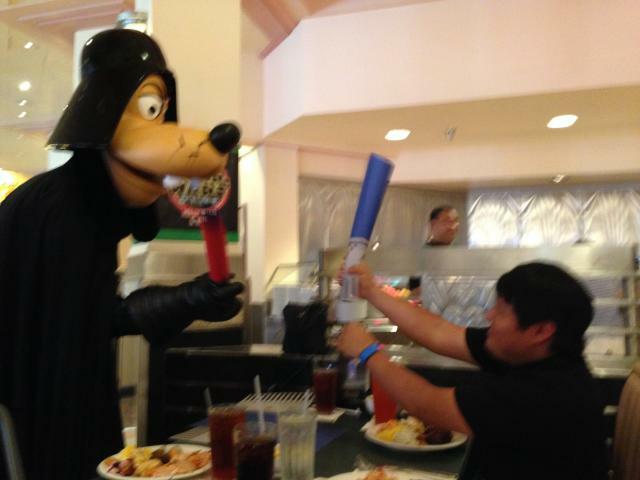 This led to inviting his cousin (a big Star Wars fan) and his aunt (a big Disney fan). Then we felt like we shouldn't leave out his mom & his brother, so we invited them to join us as well. Well, when it came time to finalize arrangements, mom & brother backed out, but aunt and cousin decided that they were in for the trip! Aunt also happens to be a big fan of butterflies and since this was the last weekend of flower & garden, it was pretty much perfect timing. As our trip got closer, we began to worry about the logistics of traveling with aunt. 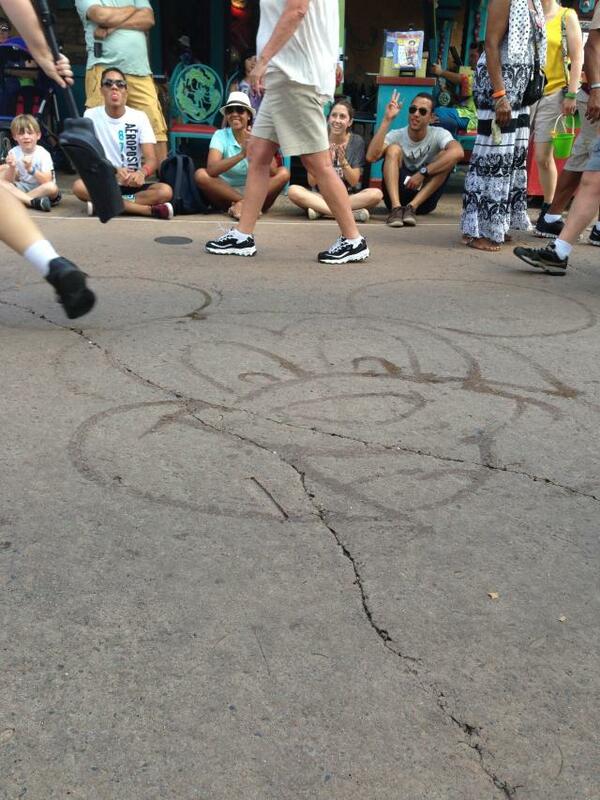 My dad had a lot of trouble keeping up in the parks in April. Aunt has two knee replacements, low activity level on a regular basis, and asthma. Would she have trouble, too? We didn't like some of the reports that tee had read about scooters not holding enough charge to last a whole day, so we didn't want to go that route. If we needed to rent a wheelchair, how would it work? Where should we rent from? We've watched other people load and unload scooters from the bus and it looked very unpleasant to us. Should we rent a car? Will the wheelchair fit in the car? So we had decided that we definitely wanted to get a wheelchair for her and that we absolutely did not want to deal with moving her on and off the bus on the chair. So, we rented a wheelchair from Walker Mobility and a car from Dollar at the airport. We arrived at the airport VERY early because aunt has had problems in the past with going through security with her knee replacements. So, we agreed to meet at BWI at 4am for our 6:15am flight. The airport is an hour from our house, so after getting home from work at 9:30pm the previous evening, I was up at 2:00am to get ready to leave. It amounted to less than 4 hours of really awful half sleep, but hey, it's a Disney trip! So I toughed it out As it turned, out, we had no trouble with check-in or security in Baltimore and unlike our very early April flight, there was barely even a line to get through security. We had time to eat breakfast and get ready to pre-board on the basis of disability. Our flight was very bumpy pretty much the whole way to Florida. This has been the case for us frequently on Southwest as of late and we're not terribly happy about it. But, the important thing is that ultimately, the plane landed safely. To legitimize Magical Express claiming and transporting our luggage, we kept out reservation active and Benn and cousin rode the bus to OKW while aunt and I picked up the car and made a stop at Publix for water and snacks. 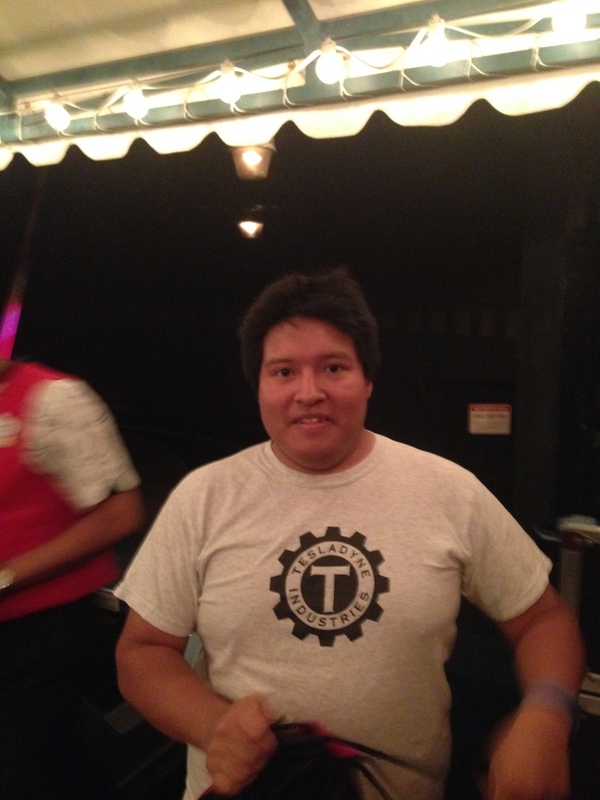 Benn was able to check-in and meet the people from Walker to pick-up the chair right at Old Key West. By the time we arrived, all of this was accomplished and we already had our room--number 1223 on the second floor across the street from the Hospitality House. Something I did not realize: OKW has rooms that are not accessible by elevator. OOPS! I always choose a 2nd floor (or higher) room because, you know, it's Florida and there are bugs! Fortunately, for the few times that we had to go in and out of the room, aunt was able to manage to climb the steps slowly. I'm certain that we could have been moved to the first floor, but aunt assured us that she could manage the steps for 5 days and that it was fine for us to stay on the 2nd floor. So, this is something that you should know if you plan to stay at OKW and are traveling with someone who has a disability. You might want to book a first floor room! You may recall that Benn had been having significant Magic Band/MDE issues and I'm happy to report that Hannah, the Guest relations rep that we had been working with, helped us to get everything sorted out and when Benn checked in, he was given yet another magic band that...drumroll please...WORKED! In fact, it seems that all bands have now been linked to Benn's account and are working properly! Stephanie and her team at OKW did a phenomenal job of making us feel welcomed and appreciated, but more on that later. So, we explored the room a bit. We had decided to stay with the 2BR and it was such a great room! The balcony was accessible from both the living room and the master suite. Having 2 full baths was fantastic! It made it so much easier for everyone to get ready in the morning. There were a ton of great little theming touches in the room. We had a beautiful golf course view--much better than the standard view of a tree that we had a Boardwalk last month! And since we had the rental car, it didn't matter that transportation at OKW is predominantly bus service. Since we were all hungry and we knew it would be at least 45 minutes to drive to TTC, ferryboat to MK, go through bag check and park admission, and walk to a counter service restaurant, we decided to grab lunch at Good's To Go by the pool. The food was good--comparable to other counter service locations. I had the chicken caesar salad and it has ample chicken, which I was pleased with. The chicken was very processed, but that's typical of that food item at this type of restaurant. Benn had a cheeseburger I think. Whatever he had, he said that it was good, but not overwhelmingly fabulous. We also tried the Conch soup, which was definitely my favorite part of this meal. The service seemed unnecessarily slow. They were busy, but not completely swamped and it seemed like it took a long time to get our food. It was good enough--I would eat here again under similar circumstances. It was well worth it to not have to deal with navigating entry into MK on an empty stomach. 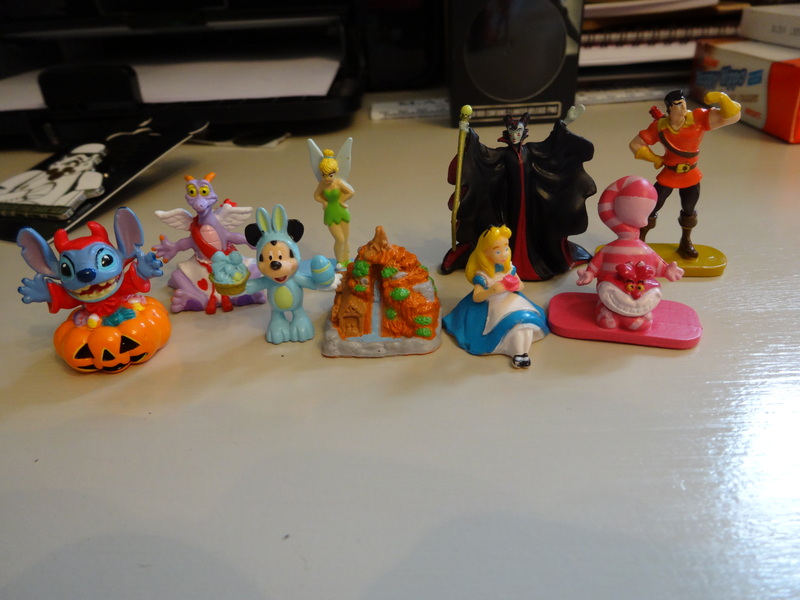 On out next post, we'll be in MK! Yay for a working magic band! 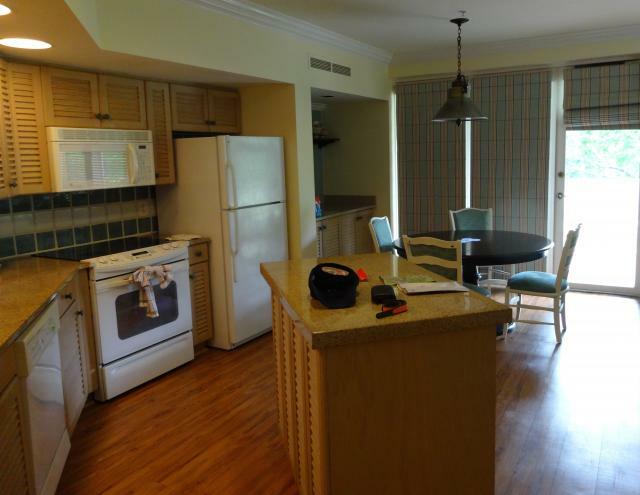 The OKW room looks very nice! Can't wait for more! 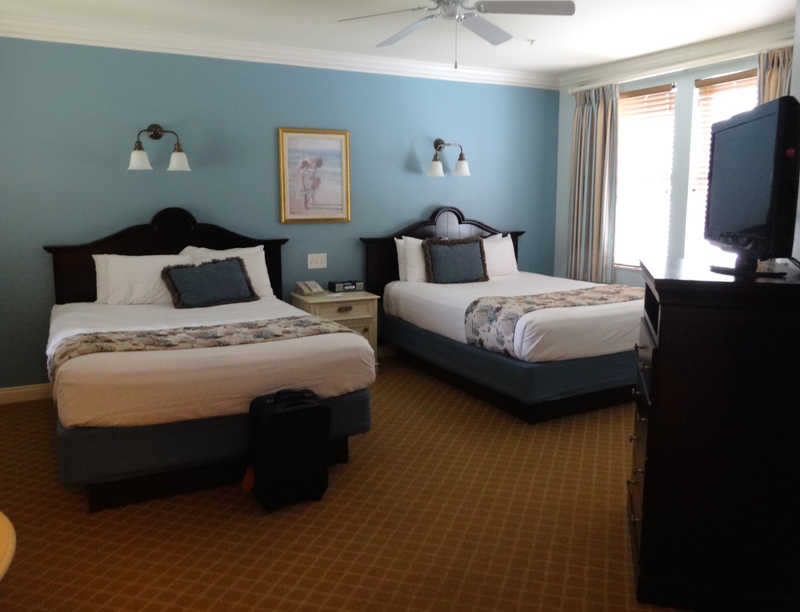 We loved the rooms at Old Key West when we stayed there two years ago. Love the room! It looks very nice! Great room. 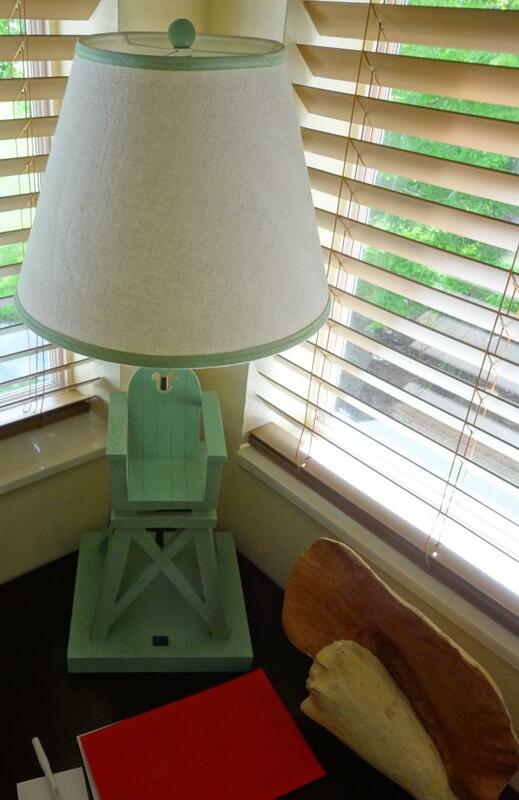 I love the lamp. looking forward to reading more. Off to a great start - more please! I might be a little slow on this one. work has been nuts since I've gotten home and I just imported Benn's pictures, so we are up to 1900 pics from 5 days...yikes! Hopefully I'll have most of the weekend free to catch up on Disney necessities! Before we go to MK, one more resort thing--we stopped at the Concierge on our way to lunch. Because we were staying in the same room as aunt & cousin, there were a few considerations. The most important of which was the fact that MDE only allows you to set up one credit card for charging online. So, we had to stop by and get aunt's credit card set up on her band. The process was very easy and all of our charges were correctly accounted for. So, if you are staying with another family in the same room, it is possible to have more than one credit card on file for the room, but it currently has to be done in person. We drove to TTC and took the boat to MK. Our first observation with pushing aunt on the wheelchair is that there are A LOT more hills in WDW than you think there are! Holy crap I was tired after 5 days!! Being able to use handicapped parking seemed like it was going to be a good deal, but we found the quality and application of said parking to be somewhat suspect daily review of parking to follow in subsequent posts. On our first day at MK, we got a spot in the front row despite not arriving at TTC until after 1:00. Getting on and off the ferryboat was super easy with the wheelchair. There are no special ramps to put out. You just wheel right on and there is ample space to maneuver and we found that even at park closing, this was an easy way to get back to TTC. Another lesson learned: remember those hills that I had never noticed before? Well, the bag check areas are not perfectly level. Trying to simultaneously push the wheelchair forward while presenting my own bag for checking was not an easy task. After a few trips through bag check, Benn became the wheelchair handler (he never carries a bag into the park) and I just dealt with my own bag. That made the process go much more smoothly. Once we entered the park, we wandered up Main Street and enjoyed Dream Along with Mickey, which was in progress on the castle stage. The sky looked very threatening toward the end of the show, so we ducked into Hall of Presidents to kill a half hour and hope for the storm to pass. Here there was a particular door on the right for handicapped guests and we were all able to sit together in the back row. It was a great location if you're ducking in for a quick nap, but this is one of the shows that looses a little something for me when you watch it from the back--probably because my vision is so poor--LOL! After HoP, it was time to get a spot for the Festival of Fantasy Parade!! Fortunately, the handicapped seating area was right across from HoP and it was a really nice location. Unfortunately, even though the storm seemed to have passed, it was still drizzling off and on, so we got the "rainy day parade". 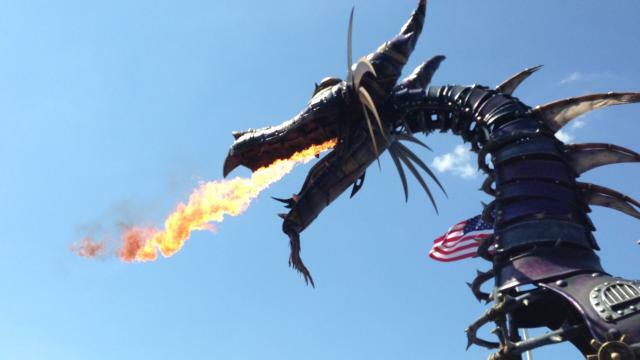 It was sweet that instead of completely disappointing everyone that they still ran something, but we had already seen festival of fantasy, so this was a BIG let down!! The good news is that since the parade was short, we had plenty of time to make it to our Haunted Mansion FP that I had scheduled for right after the parade. Haunted Mansion handicapped accessibility was my second favorite. We went through the stretching room where the CMs where extremely helpful at guiding us and never missed a beat. Each time we rounded a corner, there was another "friendly" face (well, as friendly as the HM CM's are allowed to be!) to help us. 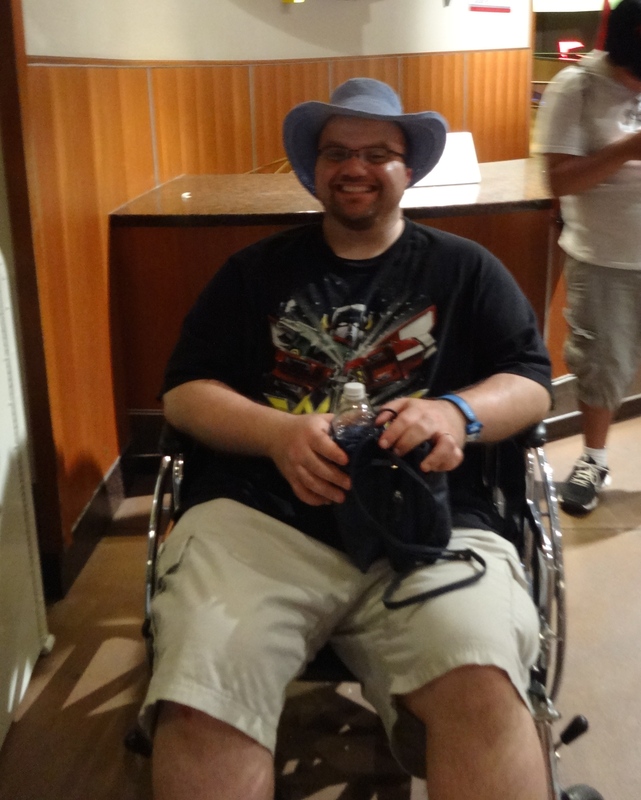 From the stretching room, we were escorted out a side exit to park the wheelchair and escorted to the ride exit area. The CM slowed down the conveyor so that we could board and we got to ride through the tunnel between the unloading area and the loading area!! I know, I'm a total dork, but I was ridiculously excited about this 5 second backstage experience. After HM and a visit to the Rapunzel's restrooms attraction, we went to Small World and attempted to use our FP. We were told not to scan in because the handicapped accessibility area was not linked to the FP area. 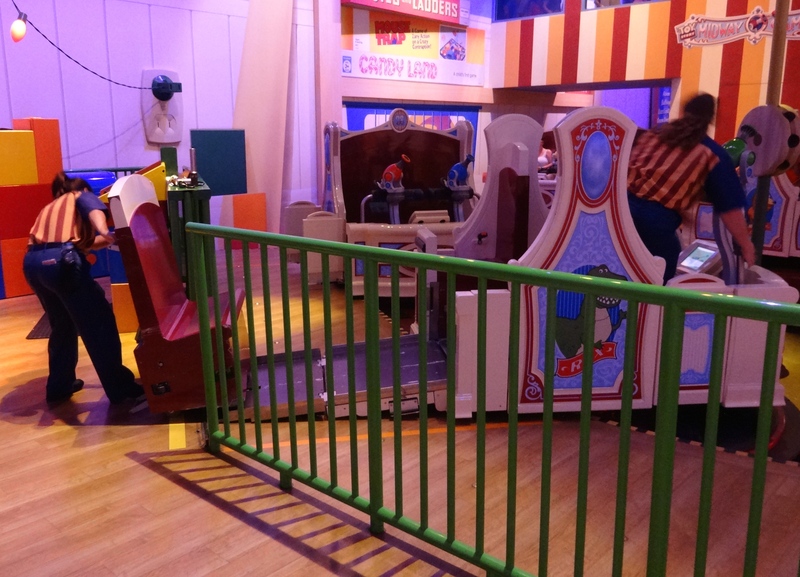 So instead, we entered by Pinocchio's Village Haus, went down the exit ramp, and boarded from the opposite side. For the second time (same thing happened in April), we got stopped in the final room where everything is blue & white and you can hear the English lyrics. 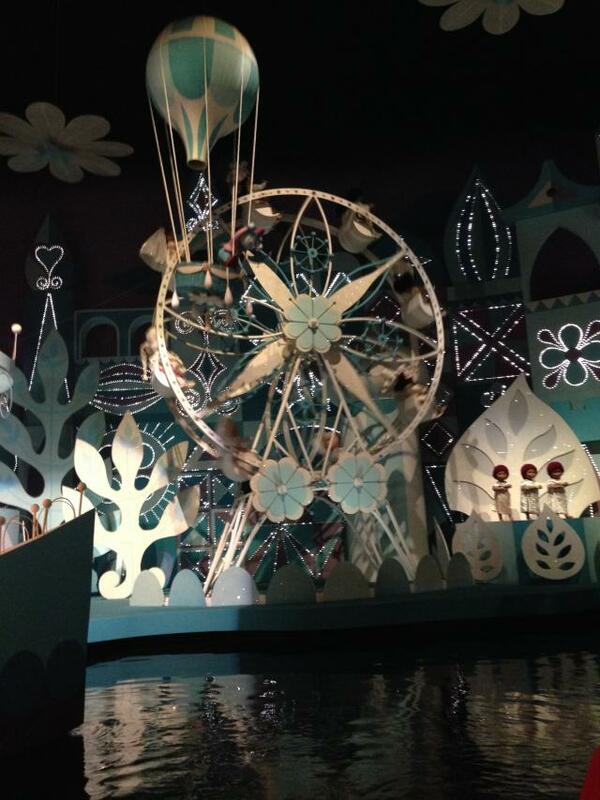 So I actually got some good pictures from Small World for a change. Also important to note that if you are traveling with a guest in a wheelchair, there is no advantage to using a FP here. Next stop, Philharmagic. Once again, there was a designated handicapped ramp and entrance area and like HoP, we were seated in the back. Unfortunately for this show, it is very difficult to see Donald's finale from the back row. Our last ride before dinner was Peter Pan on FP. There was a special handicapped gate that we went through at some point, so I can't remember for sure if this was a good use of FP or not. I think it was because I'm fairly certain that we would have had to go through the regular queue line otherwise and I think that gate was close to the end. It was a lot easier for aunt to get onto the ride here than at HM because the conveyor is longer and it moves slower, so that was good. (Handicapped accessibility will be a running theme in this report because I found it absolutely fascinating to watch how everything was handled and I have to say that literally every single CM that we encountered was courteous, professional, and extremely well-trained in how to assist physically handicapped guests. This was a different side of Disney than I have ever had the opportunity to witness and I am so very impressed with how aunt was treated and the accommodations that were made as a standard course of action without us even needing to ask for assistance. Next up was dinner at Tony's. Aunt is a huge Lady & the Tramp and Snow White fan, so Tony's was a no-brainer for dinner. I had a spaghetti with meatballs and Benn had the Chicken Parmesan, so of course we split each entree in half so we could share. I love spaghetti and meatballs, but the chicken parm was delicious. Now, the real reason that I wanted to eat here was for the pistachio creme brulee. 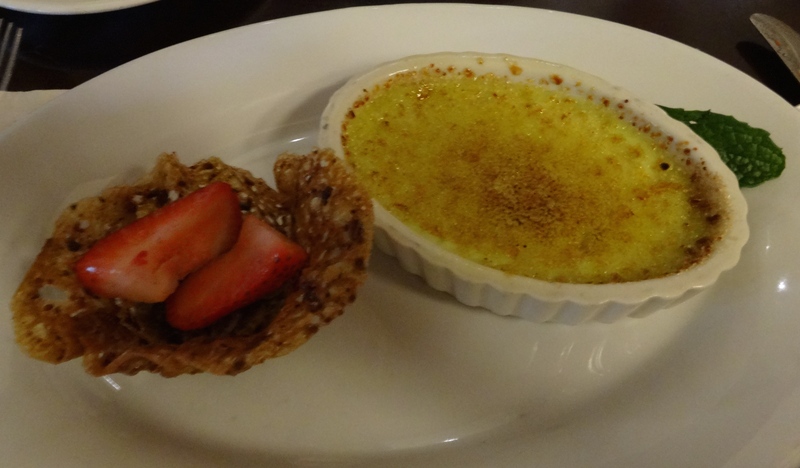 It is my absolute favorite creme brulee and it's probably on my all time top 5 favorite desserts anywhere. It's nutty, and creamy, and sugary all at the same time and that sticky, flakey nut pastry thing that they serve with it is fantastic. Benn had berry sorbet and it was good, but compared to the creme brulee, no contest. After dinner (during which we missed another major rain storm), we stopped to see Mickey at Town Hall since the posted wait was only 15 minutes. Sadly, he wasn't talking when we visited. We had switched our unused Small World FP for Pirates, but aunt was pretty tired from the very early morning, so we decided to go back to OKW. Cousin had purchased tickets to see the Aquabats, who were playing at House of Blues that night, so he took the boat to DTD and we sat around and chatted/ contemplated going back to MK (or at least to Top of the World) for fireworks. In the end, we decided on an early night because the next day was the start of STAR WARS WEEKEND!! While we were sitting around in the room, we heard a knock at the door. We weren't expecting anyone, so when we answered the door, you can bet that we were shocked to find two OKW cast members each holding an insulated cooler full of goodies!! At first, we though that Benn's mom might have had them sent because that's the sort of thoughtful thing that she would do, but further investigation revealed that they were either from Stephanie, the manager at OKW which whom we had been speaking regarding Benn's Magic Bad issues or Hannah, the Guest Relations manager/ tech support liaison with whom we had also been speaking. 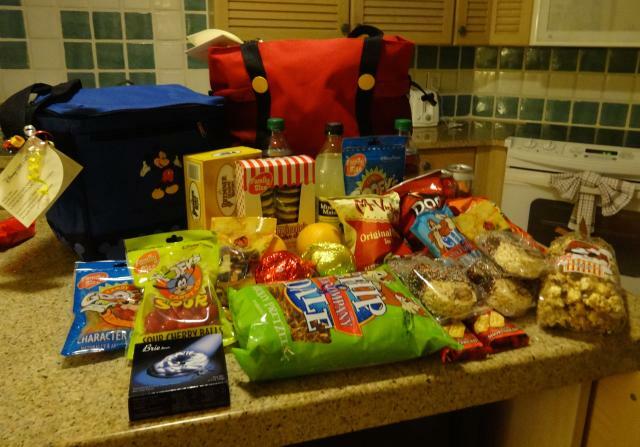 I'm still not 100% sure who was really responsible, but it was very sweet of them to send such delicious Disney snacks in the beautiful insulated bags. We were blown away! I am glad that your experience was so great. We went to WDW with my MIL who often needs a wheelchair 2 years ago. I was amazed at how seamless everything was. That was part of our rationale with doing a wheelchair!! My other concerns were the battery dying, the scooter being rather slow, scooter being heavier to lift in and out of the car, etc. The bonus of the wheelchair is that that I definitely didn't loose any time in the gym while we were away! It was also amazing to see how many places that are marked "handicapped accessible" that are just barely realistically big enough to be accessible. We did rent a wheelchair that was larger than "standard", but still, there are some places that are seriously a tight fit!! Great TR alicemouse and so happy to hear you no had major issues with Benn's magic band. Wow, that is a lot of snack stuff! Definitely some Disney magic there. 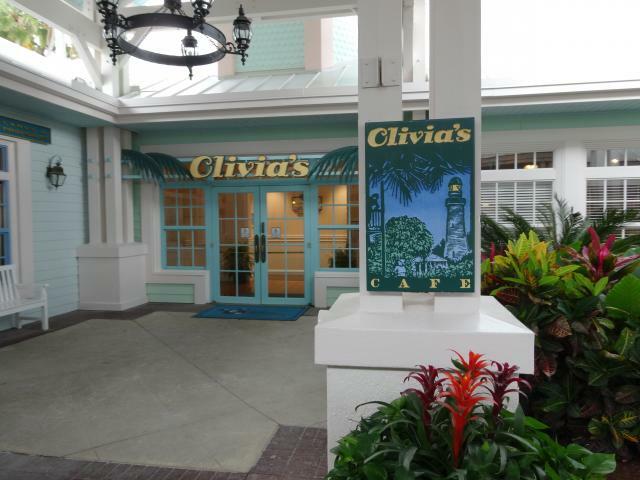 Love the pictures of OKW. That was a great Disney Magic package too. Ok let's try this again...I was finished writing day 2 and when I tried to open the pictures I was going to use in iPhoto so I could crop them, my computer froze. I'm not so much a fan of the "upgraded" operating system that I was recently prompted to install. So we tried a character meeting line. 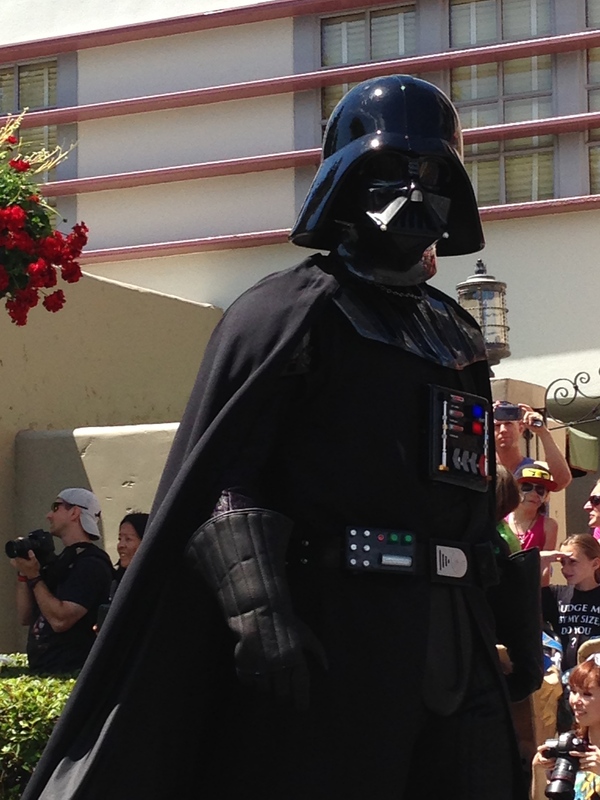 The first one that we stumbled upon was Darth Vader. An hour and a half wait was probably not really all that bad, but we just didn't want to expend that kind of time for a meet and greet. We thought we lucked out when we found a line with only 6 other families in it, all of whom were waiting for two random Jedi Council members that were expected any minute. Well, after waiting for about 20 minutes, we were informed that they would start the meet & greet in 30 minutes. Not worth it for us--might as well have waited for Darth Vader at that point. We decided to ditch the Star Wars specific stuff for a while and see Muppet Vision 3D. This is only the second time I've seen this show and I liked it a lot better this time. The wheelchair access was similar to philharmagic. We were in a sectioned off area prior to the start of the show and the back row was designated for handicapped guests and their families. It was very easy to get in and out and the show was not at all diminished by sitting in the back. By the time Muppet Vision was over, our Toy Story FP was open. This was probably the most interesting ride of the trip as far as handicapped access is concerned. The view from the alternate loading area allows you to see aspects of Andy's room that your can't see nearly as well from the stairs or the standard loading area. We could see the control panel for the ride that the CMs assigned to our area used to keep track of which cars were where. The process of converting the ride vehicle to accept a wheelchair or scooter and back again is fascinating. The entire ramp system is contained within the car and it folds out to wheel the removable seat in and out. The two CMs who were operating the ride that day were masterful at this process. Also, we didn't learn until later, but apparently there is a push button firing mechanism in addition to the standard pull string firing mechanism for game play. After Toy Story, we decided to find a spot for the parade. 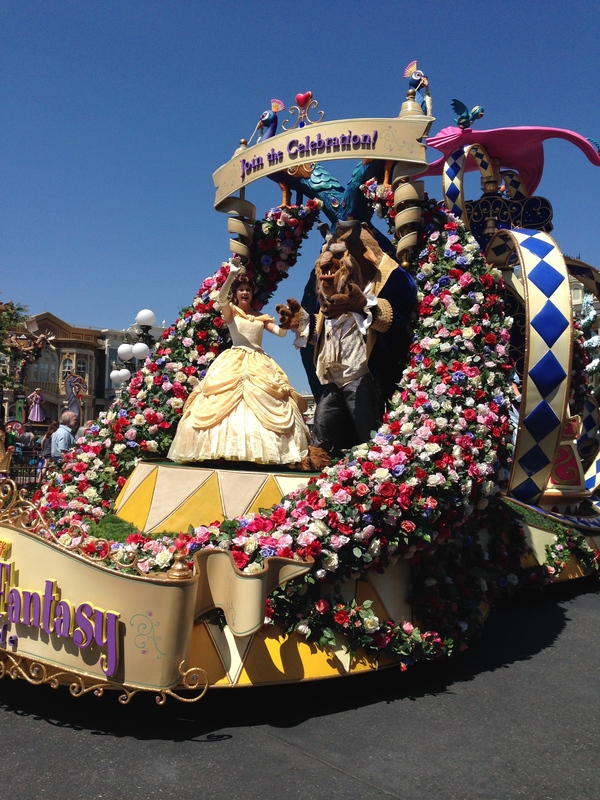 The handicapped viewing area for this parade is very limited and in order to accommodate as many guests as possible, only 2 family members can stay with each guest who needs assistance. Rather than split up, we decided to find a different spot since we were fairly early. We ended up with a spot right at the beginning of the parade route. 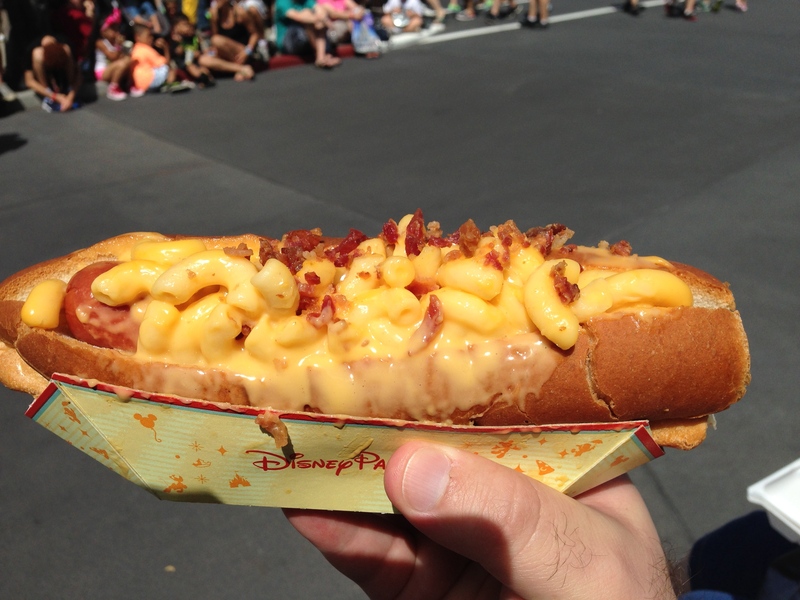 Cousin and I went to Fairfax Faire to pick up the mac & cheese hotdogs and we ate while we waited for the parade, which was not only a good use of time, but also kept us from eating lunch too close to our dinner reservation and eating immediately prior to riding Star Tours. The parade was longer than I expected and it was fantastic. There were no floats of consequence, but the amount of acting by the folks who were marching in the parade kept everyone entertained from start to finish. I thought it was great even though I didn't know who most of the characters were. And getting to see Benn as excited about something at WDW as I usually am about every new detail and nuance that we find was really cool. Since we were at the beginning of the parade route, we got to follow the rope almost right up to the stage, so we had a decent spot to watch James Arnold Taylor officially open Star Wars Weekend. His enthusiasm was contagious. At first I had been wishing that I would have recognized the name of the host, but I was really impressed with him. If you really want to see the parade, my recommendation would be to find a spot near the hat by 9:30 and stay put after the parade passes you because the parade comes back down the street in the opposite direction as soon as the stage presentation is complete, so if you have a good spot, you get to watch the parade twice and still see what's happening on stage. Next up was Star Tours. We parked aunt by the abandoned FP kiosks, which we have determined is a good strategy for most rides. 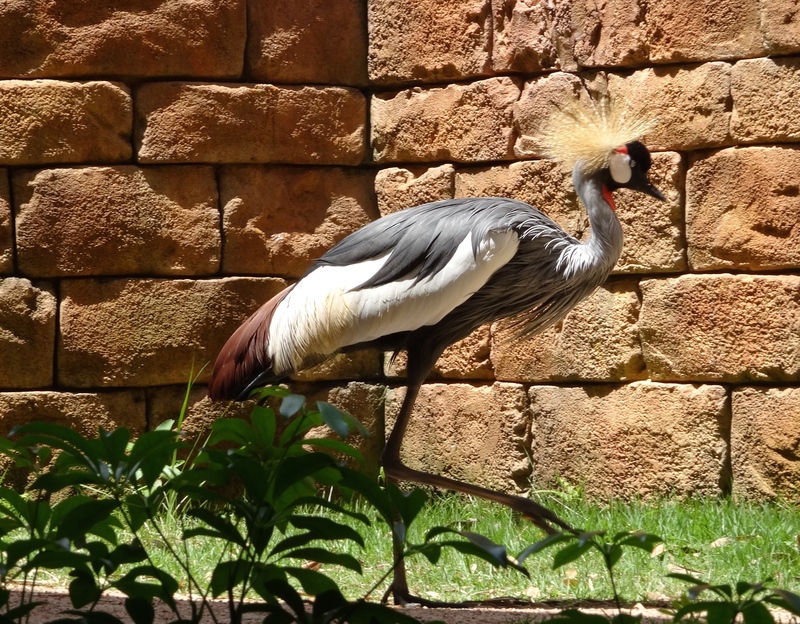 It's off the main path so she didn't get trampled and she could get a few minutes of relative quiet in the shade. But, it's close enough to the action that it wasn't boring for her to wait there. 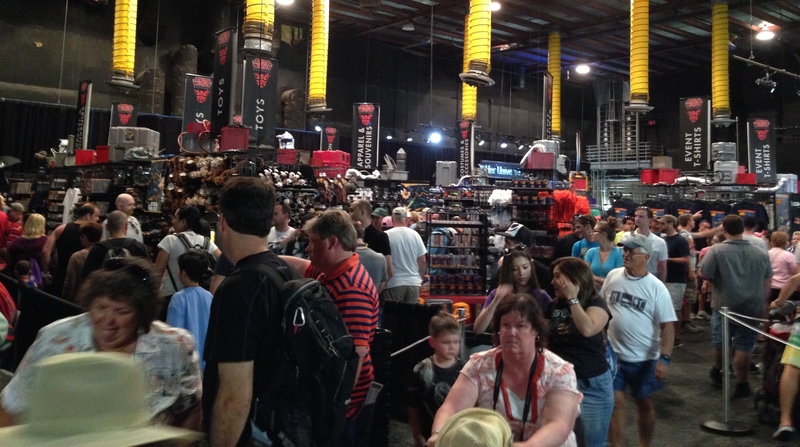 I would have expected Tatooine traders to be packed, but it was actually pleasant to walk around in there for once because all of the shopping was happening over at Darth's Mall. Next we crossed the park to see Beauty and the Beast. We usually skip the show because we've seen the full Broadway touring version and let's face it, the version at DHS is barely a shadow of the Broadway show, but it's cousin's favorite Disney movie, so we obliged. It was better than I remembered. This was one of the places where pushing the wheelchair was rather difficult because the ramps seemed extra steep. Then we crossed the park again to try to catch Indiana Jones. One thing that Disney does to really help disabled folks to make the most of their day is to reserve the appropriate seating until right before the show starts. Because other parts of your trip go slower, it's nice to not have to be so early for the shows to get a good seat. Next up was the backlot tour. They were just calling for volunteers when we arrived and no one seemed to want to do it, so I volunteered and I was assigned the part of "mechanic". You know what that means!! I was getting drenched! I always figured that being hit by so much water would hurt or at leas knock you off balance, but it's filtered out by the wall. So volunteer in confidence! 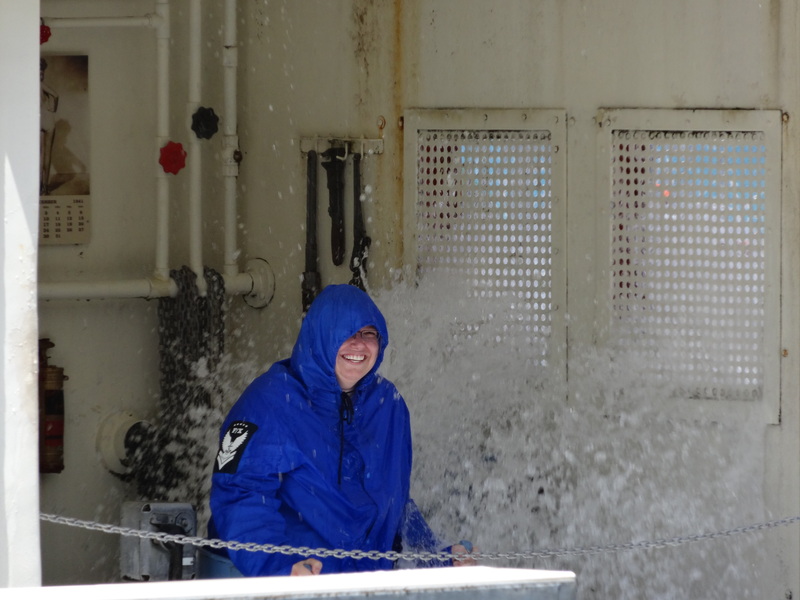 You will stay dry and you can barely even feel the water hit you! The loading process for the tram was excellent once again. Because aunt could transfer from the chair, a CM took the chair after we loaded and moved it to the unloading area for us. 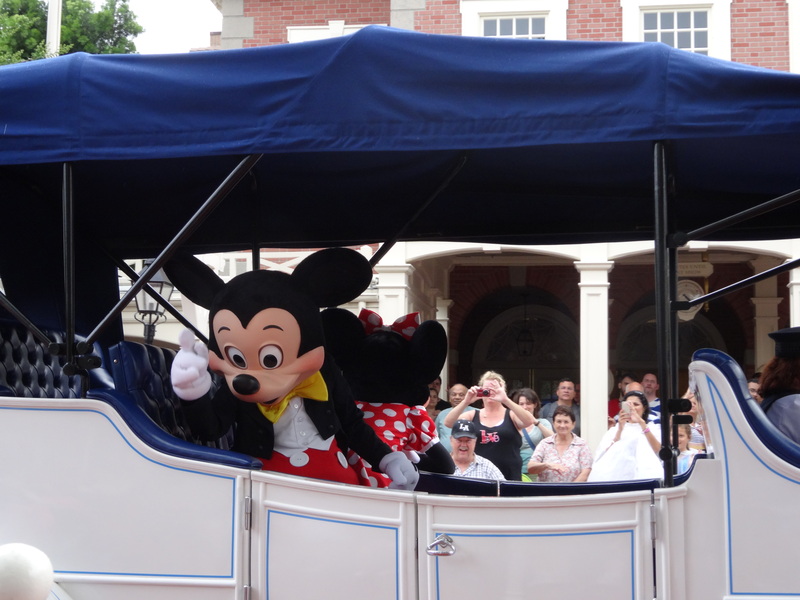 We saw two cool and unusual things during the tour--Jedi Mickey riding a golf cart on his way offstage and the cars from Lights, Motor, Action revving their engines on acceleration alley before making their entrances onto the stage. We were hoping to catch the Maleficent preview before dinner, but we were a little tight on time, so we decided to wait for the whole movie to come out. It starts locally on Thursday night, so we don't have too much longer to wait anyway. 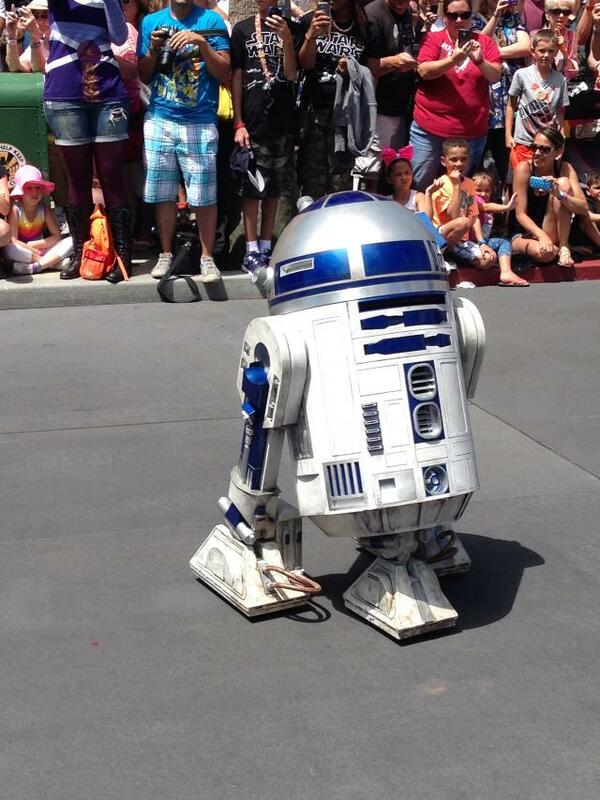 Our ADR was for Star Wars Character dinner at Hollywood & Vine. WOW! What a great event and worth every penny. We met 6 characters without waiting in a single line. 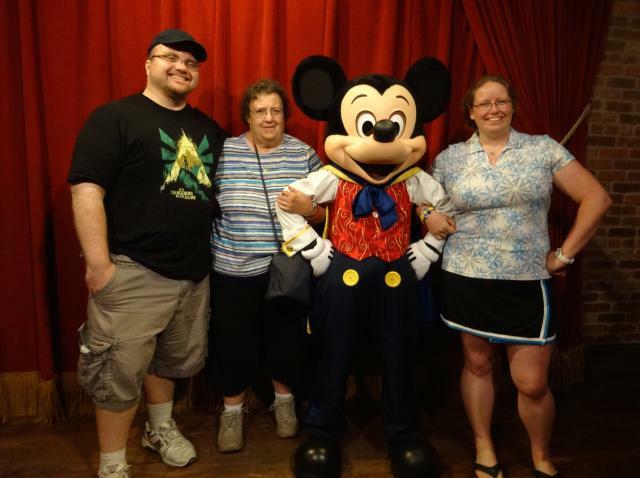 We were the second family to enter the restaurant, so everything on the buffet was fresh and since the restaurant took a while to fill up, we actually saw Mickey, Minnie, Donald, and Goofy 3 times each. The "choose your side" roll up lightsabers were really cool and we had the characters autograph them based on which side they were on. The presentation on the desserts was phenomenal. The taste was hit or miss for me, but I'm fairly picky about dessert. Our favorites were the mussels and shrimp from the cold bar, the meatballs, lobster mac & cheese, chocolate covered strawberries, and blue ice cream. After dinner, we tried Darth's Mall again and found that there was no line and that all of the LE stuff that we cared about (i.e. pins) were still in plentiful supply. We picked up a Darth Vader pin backed on pictures of original concept art (LE 2000), a reveal/conceal mystery box (we got a Luke Skywalker and a Darth Vader! ), a few rack pins, and the two featured pins for SWW. The coolest thing about Darth's Mall was "Ackbar's Snackbar". It was difficult to maneuver inside with the wheelchair. It was very crowded, pushing on the carpet was difficult, and the displays did not leave a lot of room for error when turning the chair around. Next up was One Man's Dream and then onto Animation Academy where the subject for our artwork was Stitch!! Our animator was very fast with his instructions and it was a little bit difficult for cousin to keep up. 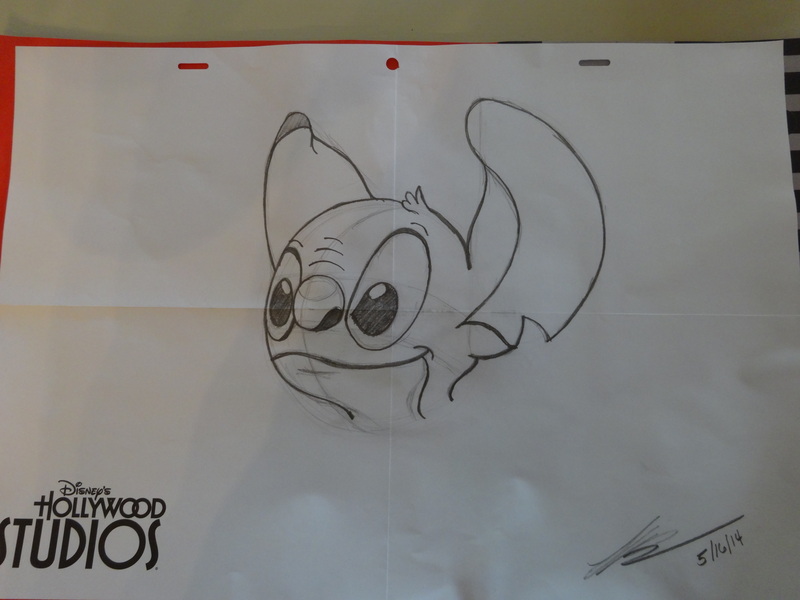 I've done quite a bit of Disney drawing, so I was ok, but if this was your first time, you were hustling to keep up! 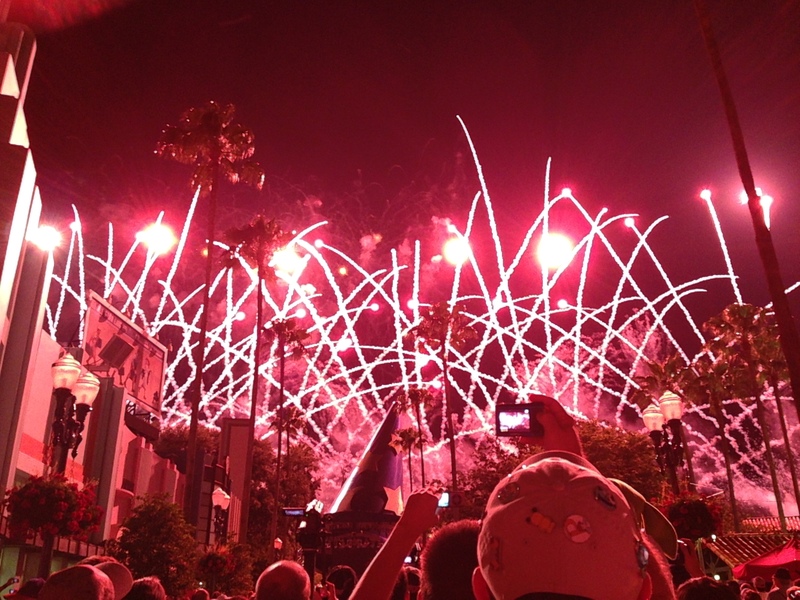 The crowds were starting to build, so we hopped behind a line to have a spot for fireworks. I forget what the show was called--fantasy in the sky or sorcery in the stars or something like that. Let's just say that fireworks set to John Williams' Star Wars score was epic. Last up for the evening was the 10:30 Fantasmic! It was along day, but it was a great day! I loved that everyone was having too much fun to take a break! 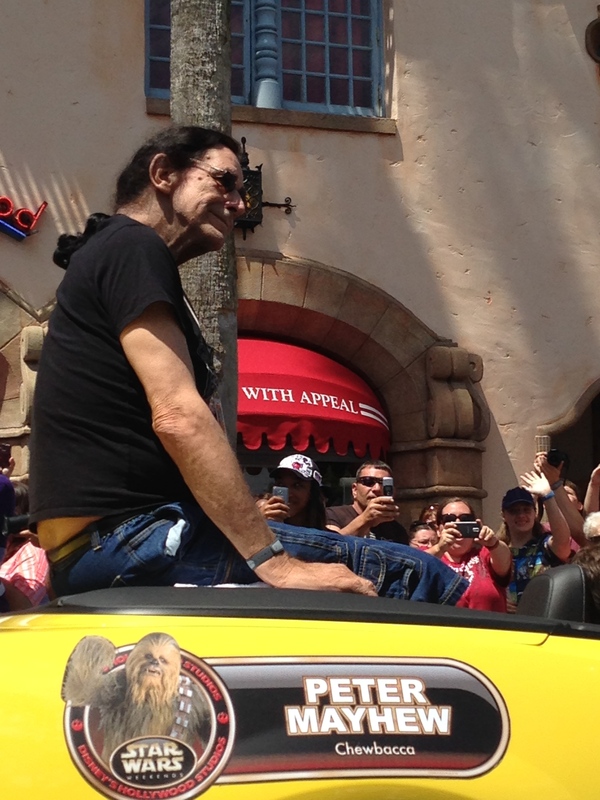 OMG you saw Peter Mayhew!!!! I guess you weren't able to get his autograph, but you still got to see him. We were running late again and we arrived at MK just after rope drop. Handicapped parking was not offered in the front of the lot at TTC this morning. We were parking on the opposite side of the lot where we had parked on the first day and the parking attendants were clearly giving us a preferred space on the end of the row instead of making us drive the wheelchair down the very long row to the tram loading area. We were still close, so we opted to walk instead of dealing with getting aunt on and off the tram and stowing the wheelchair. I mean, it was probably 300 yards or less from the car to the ferryboat. Totally not worth it to ride. This makeshift handicapped parking area worked fine for us, but I think it was just a regular space. I hope that if someone actually needed the extra space to get in and out of the car that they would have been able to access the regular handicapped spaces. Our day started at Enchanted Tales with Belle. We had originally opted to skip this attraction because while it is very cute, it is very much kid-oriented. I was going to maybe take aunt while Benn and cousin were on Space Mountain, but when we learned that cousin's favorite movie was Beauty & the Beast, we decided that we had better all go. Since I hadn't gotten a FP, we made it top priority during the "golden hour" while attendance is at its low for the day. 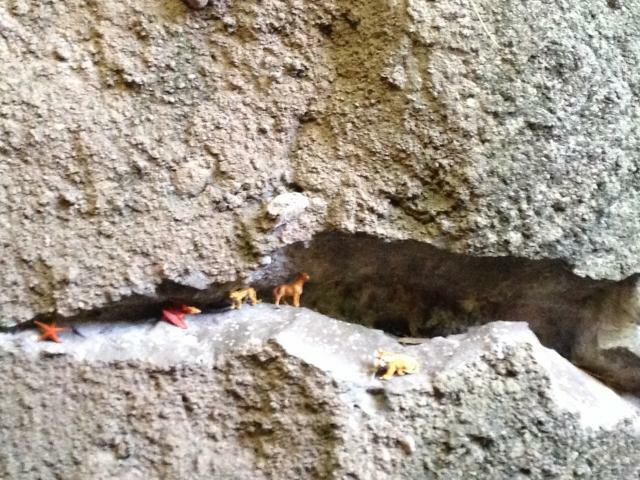 After ETwB, we were walking by BOG on the way to Under the Sea and noticed something very peculiar. With only 30 minutes until opening, there were only 3 families waiting for BOG to open! So, we ditched out plans for Under the Sea (honestly, we're a little bit disappointed in this attraction anyway, so it was not worth missing the end of our Space Mountain FP window) and opted for a very early lunch. We also had the opportunity to walk in and take pictures of an empty restaurant. We also proceeded to torture ourselves by watching the lucky, lucky cast members who were riding on test runs of Seven Dwarfs Mine Train. Lunch was delicious, just as it was last time. I had the...I'm not going to try to spell the French version...the ham and cheese sandwich. Benn had the roast beef. Lunch here was a big hit! We walked past Under the Sea and Storybook Circus on our way to Tomorrowland where the boys rode Space Mountain and aunt and I rode the TTA. I think of this as being a great place to take older folks, but she has quite a lot of difficulty using the moving walkways and there are a lot them to navigate on this attraction. It was a nice ride and she definitely enjoyed it more than she would have enjoyed Space Mountain! Our next FP was for Pirates and because lunch had taken longer than Under the Sea would have taken, we were now running too close on time to devote 24 minutes to Carousel of Progress. That's one of my favorite "nostalgia" attractions, so it's a tough one for me to skip, but since we had just seen it a month before, I just hummed the song to myself while we walked to AdventureLand and that was good enough. Pirates was great, of course. We were able to use the regular queue line all the way up to the end. 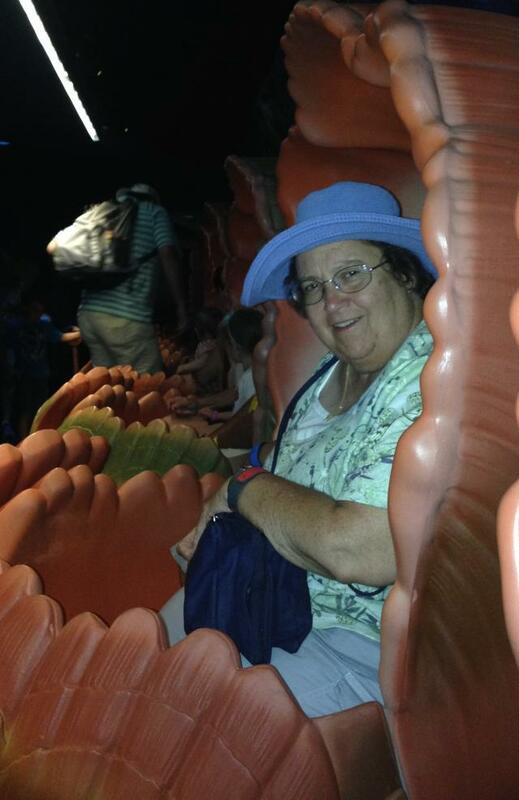 Aunt got seated in the front row and was very surprised by the splashdown! It didn't occur to me to warn her of to trade seats with her because I've never been in the front before! I still freak out for a second halfway down the waterfall when I think that the Imagineers have secretly changed it to a Splash Mountain-sized drop. When we retrieved the wheelchair at the end, we were shown to a secret elevator. It was so secret that there were no signs leading you back into the park after you exited the elevator. Our next stop was Benn's first trip to the Enchanted Tiki Room. He was actually reasonably entertained. 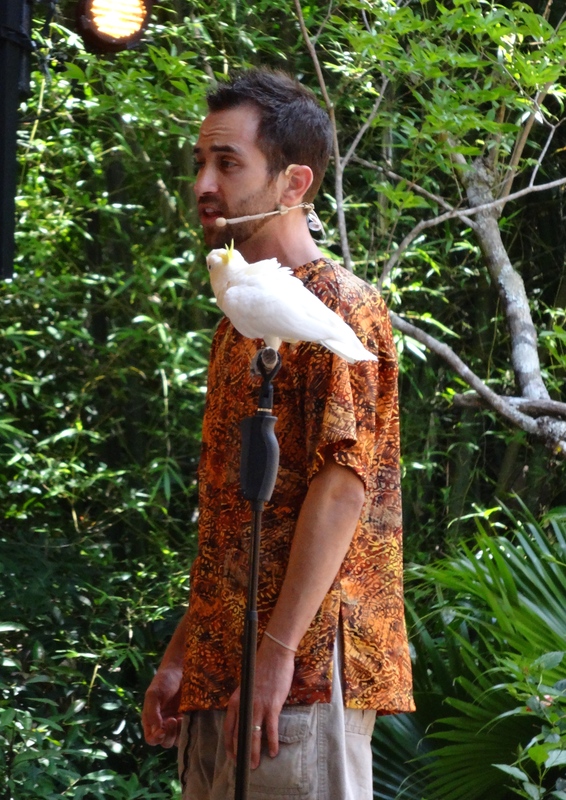 He's a little bit freaked out by birds, so we've never bothered with this show before, but I think he actually got a little bit attached to the Tiki Room song. I had a hard time sitting still through the show because BIG THUNDER was up next!!! Everyone needed a restroom break and we were going to take the train back to Main Street to get a spot for the parade, so we parked aunt by the abandoned Splash Mountain FP machines to save some severe uphill/downhill chair pushing in very heavy crowds. Big Thunder was great as always. When we collected aunt and went over to board the train, we encountered the hill to beat all hills in the shape of the handicapped ramp to the train's loading platform. To quote Vanellope from Wreck-It Ralph, "sweet mother of monkey milk" that was a steep ramp! The designated handicapped car was full, so they allowed us to fold up the chair and ride on the regular bench seats in the first car. We rode the train around to Main Street and got a spot right in front of the train station for Festival of Fantasy. Cousin and I walked down to the Ice Cream Parlor to get ice cream for everyone. 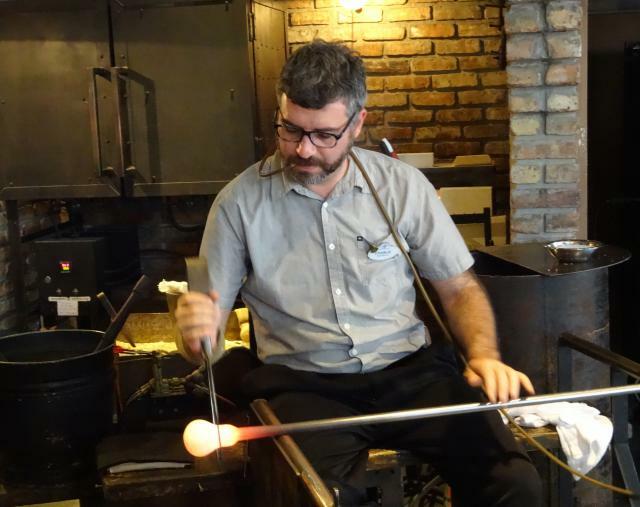 On the way down the street, we walked through the shops and to our delight, the glassblower was busy crafting away! I've never been in his shop when he has been working before, so that was a treat! 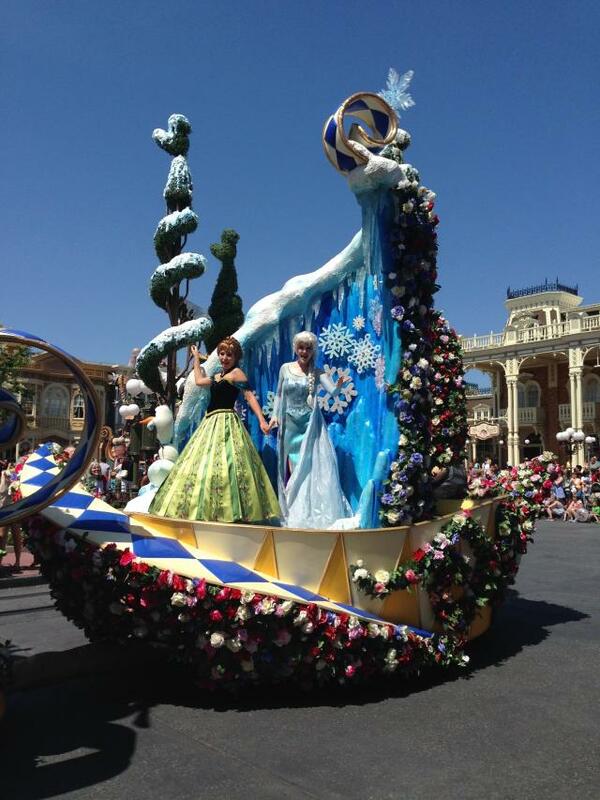 Fortunately, there was not a cloud in the sky, so we got to see the real Festival of Fantasy parade today! After the parade, we mono railed to EPCOT on the resort loop. Mistake. If you are traveling with a wheelchair, do yourself a favor and take the monorail direct to TTC. The monorail ramps are even longer and steeper than the train station ramp in FrontierLand. On the direct to TTC loop, you exit at TTC and walk straight across to the EPCOT monorail. On the resort loop, you have to exit down the ramp at TTC and walk back up the ramp to get on the EPCOT monorail. Also, there might be an elevator. There is one at EPCOT for sure and we finally got smarter on the way back and used the elevator instead! 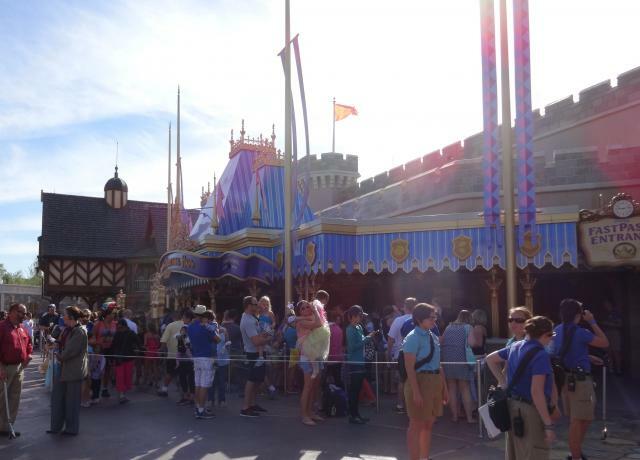 This was our first day at EPCOT, so it was more time consuming to get to Biergarten than it would have been for just Benn and me. We walked straight through Future World to Mexico, which was PACKED! In fact, WS in general was Crazytown, USA that night. We attributed it to maybe people who were at SWW came over to EPCOT looking for more delicious food? Or maybe because it was the last weekend of Food & Garden? We bailed out of Mexico quickly because for the length of the tequila line, we were going to have a very difficult time driving the wheelchair around. The little boat ride is cute, but it's just not worth the hassle. Norway was no better. We had hoped with Anna and Elsa being at MK now that Norway would be placid once again. No such luck. We considered Maelstrom, but a 30 minute wait put us in jeopardy of missing our ADR. So we walked past China and caught a few minutes of the acrobats before we proceeded to Germany. We did some pics with the Snow White topiaries and shopped for a bit before checking in at Biergarten. I was really looking forward to this meal and it was probably my least favorite of our four fantastic table service meals on this trip. It was hard to see the band because we were seated way over the the side and there were two ladies seated at our table who were quite miffed when the host informed them that they would be sharing a table with two other parties. They were shooting everyone the evil eye and they each quickly ate a small plate of food and left. Oh well. Good riddance. The fish that we had enjoyed so much in December had a very "fishy" taste that night and the schnitzel was a little bit on the tough side. Other things were delicious and the deserts were amazing--especially the bavarian cheesecake, but I had really been looking forward to the fish and schnitzel, so that was a little bit disappointing. We sat for dinner for quite a long time, so we really needed to hustle around the other side of WS to make it back to MK for Wishes. 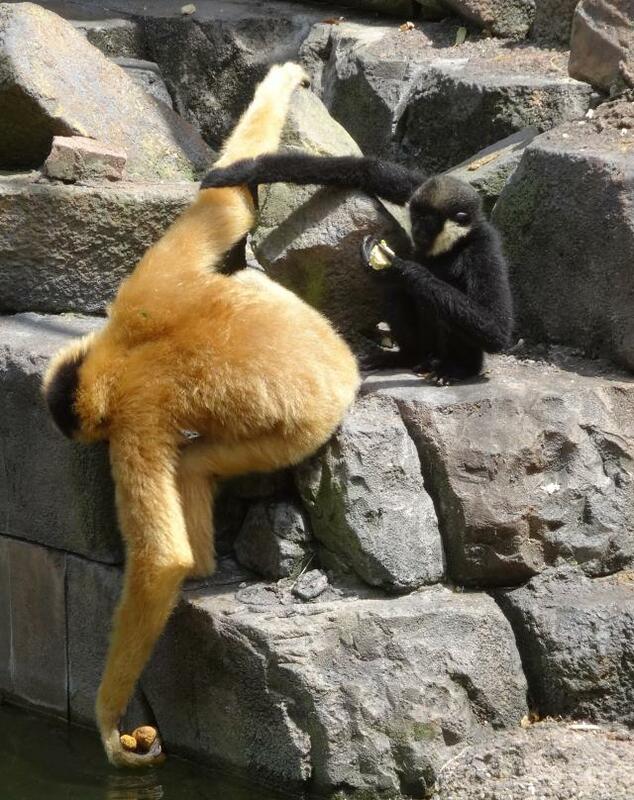 Aunt has seen it and cousin will just have to plan a trip back to hang out more at WS. We made our goal (option for the ferryboat over the second monorail leg this time) and arrived at MK about halfway through MSEP. We made our way to the back of the linear the beginning of the parade route and followed the rope up Main Street to try to get a good fireworks spot. We stopped ourselves right at the tape line for the walkway between Casey's and Edy's to try to guarantee that aunt wouldn't have anyone in front of her once the fireworks started--well, except for the people who try to stop in the walkway and have to be moved along by a cast member. I'm really looking forward to the new hub area being completed and I hope it takes some of the stress off of this situation. Aunt and cousin loved both shows, so it was totally worth it to drag them back into MK for crazy time! On the way home, we encountered a car that was parked on the side of the road leading from MK to Lake Buena Vista Drive. After the passenger exited the car (nowhere near the Hess station or any other sign of civilization), the car pulled back onto the road a few hundred feet ahead of us. The driver then proceeded to swerve back and forth slowly across the road and alternate between driving on the median and driving half in the other lane. After we decided that the driver was most likely drunk, we called 911 and reported him and requested assistance for the passenger that had gotten out of the car. We don't know what happened to either of them because we took a different ramp than the car did to continue our trip back to OKW. So that was a Disney first for us! Our last full day . Our plan had been to go to DTD this morning because aunt "needed" to go to World of Disney and I "needed" to go to Fit2Run and we had not yet had a sandwich from EoS, but DTD doesn't open until 10:00. When we took a survey of aunt and cousin on Saturday night of "things that you must do before we go home or your trip will be completely ruined", the only thing that came up was for cousin to ride Rock-n-Roller Coaster. That's lucky because Studios opened at 8:00 because of SWW. Since it wasn't something that aunt couldn't ride and it would be faster for the three of us to run over to Studios quick and she had been a little under the weather all week anyway, we decided to give her some time to rest int he morning while the three of us popped over to DHS for an hour. I don't do RNR either, so while the boys rode twice, I took another lap on TSM. We met back up right outside the Great Movie Ride and decided that since we had completely forgotten about our FP and missed it on Friday that we would take advantage of the fact that is was early on a SWW morning and nobody else in the part cared about GMR right at this moment. The quality of this ride is so dependent on the two Cast Members who do the live performances pieces, so I was happy to see our monotone driver from when we rode in April walk right past our car and jump into the one behind us. The driver that we had this time was not going to win an oscar anytime soon, but she was much better than the last one we had! I fell like half the problem with this ride is that the Cast Members running this attraction seem bored with the hokey script they are forced to do. I feel like jazzing up the script and replacing one or two movies would go a long way here. After GMR, we popped down to Star Tours just to see what standby was and we lucked out because Jedi Training Academy was in progress, so the wait was only 10 minutes. We almost always get assigned to stations D or E, but this time we got A. The only thing significant about this is that the ride control panel is much more visible at A, so we were able to watch the people before us on the "in-flight camera". After Star Tours, back to OKW to collect aunt and boat to DTD. Now aunt is not fond of boats. The ferryboat was ok and the rides on boats were fine, but she was pretty maxed out with the DTD boat from OKW. Admittedly, you do sit closer to the water here and you can feel the motion of the boat. We decided to give her an inside seat and distract her with conversation because I'm not touching a DTD parking lot with a 10-foot pole until the garage is open and in the boat vs. bus battle, there's no contest. I couldn't understand why the boat ride from OKW to DTD was 20 minutes when the ride from POR is only 25 minutes and POR is so much farther away. 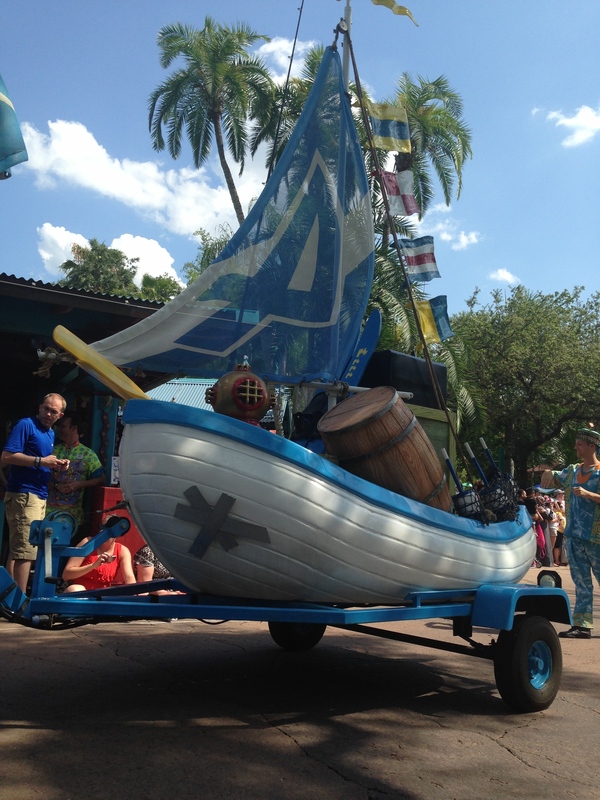 Well, the OKW boat doesn't dock at the closest point to DTD. The dock is up by the Hospitality House and the boat has to wind in and out of the "no wake" zone for half of the trip. When we arrived at DTD, Benn took aunt and cousin to World of Disney and I headed straight to Fit2Run. I had been planning on checking out the shoes here anyway, but I had a bit of an incident the day before we left for Disney that made new shoes a priority. I did a 7-milerun in my Nikes (that I hate) and as soon as I loosened my shoe, my left foot started to throb. When I took my foot out, I had so much pain that I couldn't even gently place it flat on the floor. I was actually concerned that I had broken a small bone in my foot. Luckily, my run had ended at the YMCA where I was supposed to meet my co-workers to lift weights. Instead, I spent the next hour soaking my foot in the hot tub and gently easing into being able to put it in front of a jet without excruciating pain. Then I rolled it out on a medicine ball. I was still limping when I left, but by the end of the day I could finally walk normally again. So, as you can imagine, I was very executed about stopping by the Fit2Run store to see what kind of magical shoes they had there. I had a little bit of trouble locating an employee who seemed to actually care about what they were doing, but after I settled on someone to help me, it was the best shoe shopping experience I've ever had. Anyway, they have a slow motion camera hooked up to a treadmill and you run for about 20 seconds at up to 5mph so they can analyze your gait. They do this test in a "neutral" shoe, so I could have told them before the test that my ankles would roll in because I had no support under my arch. But regardless, the test did show that I needed a shoe with more stability on the instep--valuable information because it turns out that there are shoes built precisely to address that problem. 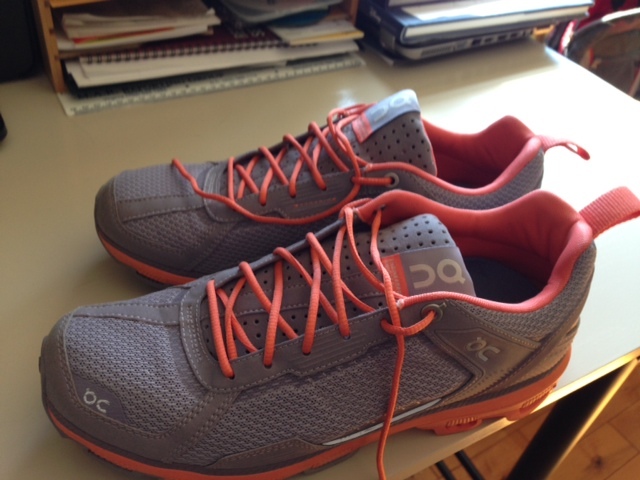 I settled on a pair of ON Cloudrunners, which are engineered by the guy who won the ironman challenge and they have little rolled shock absorbers all over the sole. I've done two runs with them so far and OMG they are the most comfortable sneakers I have ever put on my feet. The prices were honestly not as bad as I expected. There regular Nikes, Adidas, etc. are the same prices that you would find at any other retail athletic shoe store. I paid $150+tax for the cloudrunners, but they are worth every penny. I also bought a pair of flip flops that are molded to your feet and provide gentle arch support. I used to buy my flip flops from orhtaheel for $65 a pair and I almost bought a new pair before we left for Disney. These are actually more comfortable to me and they were only $35. My sales rep also offered me custom insoles, but I couldn't feel a substantial difference between the standard insoles in the shoes and the upgrades ones. She also showed me a different way to lace the shoes provide better arch support without tying the rest of the shoe too tight. So, I had a very good experience and I highly recommend this store. Our EPCOT afternoon started by stilling past the flower & garden topiaries that we had missed the previous day when we had been rushing to our Biergarten reservation. We pushed aunt over to the butterfly house. She used to work for the US Dept. of Agriculture mixing the diet for the insects and butterflies are her favorite insect, so we figured she would be very entertained while the rest of us hit the single rider line for Test Track. It only took us about 20-30 minutes to get through the line, ride, and get back to her. Cousin and I were in the same car and Benn was right behind us. After Test Track, we headed over to the Land pavilion, which was most of our reason for visiting FW in the first place. Benn's uncle passed away about 10 years ago and he worked in produce, so Living with the Land was his favorite attraction. When he brought his family to WDW when cousin was very young, he was so fascinated by the ride that they went on it 5 times in a row. So, as a tribute to him, it was an absolute necessity that we took aunt and cousin on this ride. An important wheelchair tip here: the regular queue lines cannot accommodate a wheelchair, so there is no need to waste a FP selection here (although there aren't very many 2nd tier choices that are worth using one for anyway) because all guests riding in a wheelchair and their party are sent through the FP queue. I don't know if there is a limit to how many family members may accompany the wheelchair rider. We only had a total of 4 in our party. Aunt has a fear of heights, so we decided that Soarin' wasn't a good option for her. She much preferred to hang out by the FP kiosks while the rest of us used our FP. I think the standby wait was only around 45 minutes or so and we probably waited less than 5 minutes on FP. I don't think I've ever gotten on Soarin' so quickly. The film is definitely wearing a bit, but the scents seems to be more under control this time. On a recent ride, I notices that the pine and the orange seemed like they had lingered in the air from the ride before ours. Aunt said later that her "ride" was very entertaining as she got to witness some very questionable parenting. Apparently a little toddler had gotten separated from his parents and was wandering around with his sippy cup, which he ultimately threw in the trash. A few minutes later when dad found him, he asked where the cup was. The child pointed to the trash can. The father yelled at the child for throwing the cup away, dug it out of the trash, handed it back to the child and made him use it. The child then proceeded to eat crumbs off of the floor while the father irately related the story to the mother. Gross. That was a great segue into dinner which was to be at Garden Grill--one of our favorite menus! So, we took the elevator upstairs and checked in. We were seated fairly quickly and informed that the restaurant would not be rotating this evening. No explanation was offered and we didn't ask. It didn't really matter because we were so busy with the characters that we wouldn't have had time to watch the scenes traveling by! Also, we were on the top tier, so we had a very limited view of the ride scenes anyway. 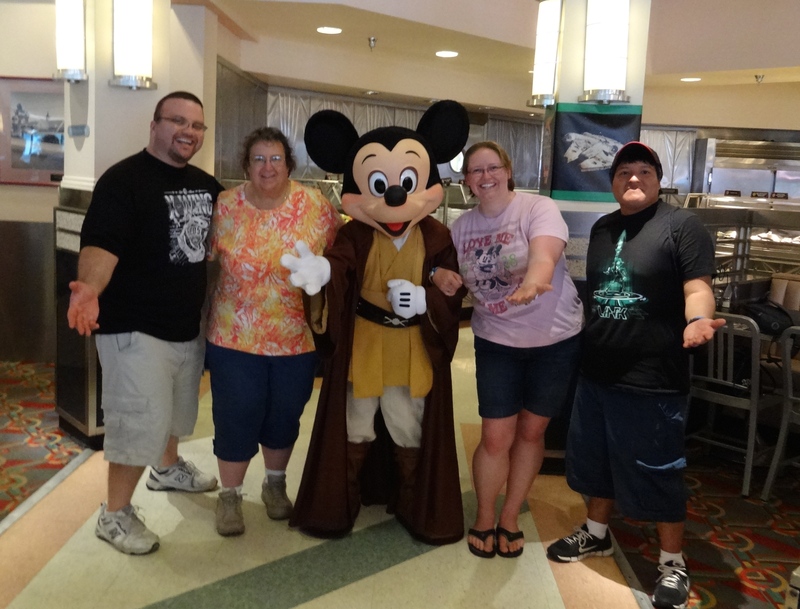 The food was delicious as always and we had a BLAST with the characters here. 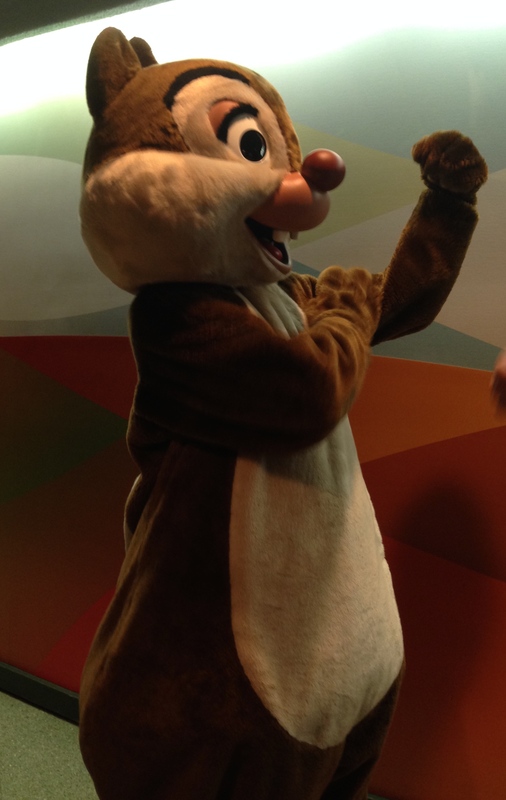 Dale was flexing his muscles at the table before ours, so I asked him who was stronger: Chip or Dale? Of course he said he was and we used that response to get Chip all upset later. We also asked each of them who is prettier and if they are brothers (turns out that they're best friends). We got Mickey in on the action, too when we told Chip that Mickey said that Dale is prettier. I lost track of how many times they came back to our table. The one time we had them sign the placemats that our server had brought for us and Dale started to do the word find puzzle. He circled Tarzan on cousin's paper and we told him about how Johnny Weissmuller, the original Tarzan, had claimed to be from the town where aunt grew up! It was great. We had tons of fun with those guys. This was also the first place that aunt was concerned about her sunflower seed allergy, so the chef came out and spoke with us. We were very impressed at the way that the process was handled. She was given dedicated food plates, individual servings of all of the food that was definitely sunflower-free, and substitutions for the foods that the chef was uncertain of. This is the first time we experienced talking about an allergy with a Disney chef. I've always heard how accommodating they are, but seeing it first hand? I'm blown away by how careful and concerned they were. Grade A customer care! We were at dinner for an hour and a half and by the time we got our, Journey into Imagination was closed for the evening, so of the things that were appealing to use in FW, Nemo was the only thing left. For accessibility here, we parked the wheelchair and it was magically transported to the end of the ride. The attendant slowed the conveyor for us and aunt was able to board without much trouble. They radioed ahead to the unloading area and the attendant already knew that we would need the conveyor to be slowed when we arrived. Everyone enjoyed the fishes and the dolphins were being as uncooperative as always. Nothing much new to report here! After the Seas, we were getting close to IllumiNations start time. We hadn't intended to try to take aunt and cousin to IllumiNations. We needed to pack that night, cousin wanted to check out a movie at the AMC theater, and Benn and I wanted to check out the pool. So we boarded the mini-bus back to OKW. Now bear in mind that the only Disney pool we have ever taken the time to swim at was POR in the quiet pool in Magnolia Bend. 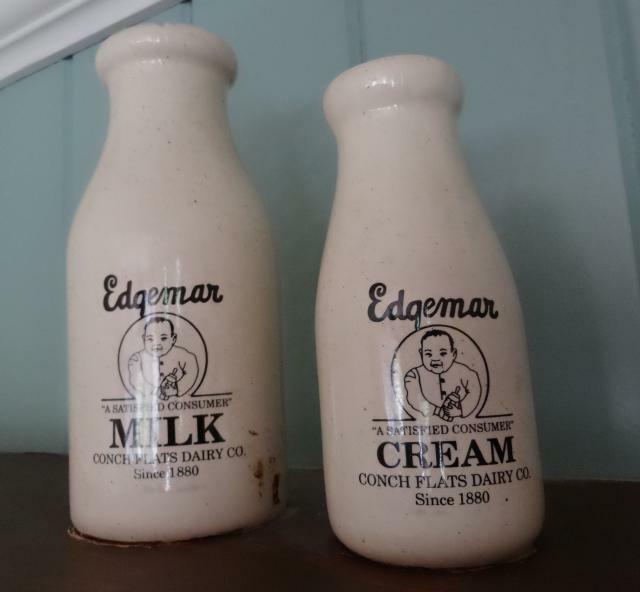 We skipped the pool at Coronado, All-Star Music, Saratoga, and Boardwalk. 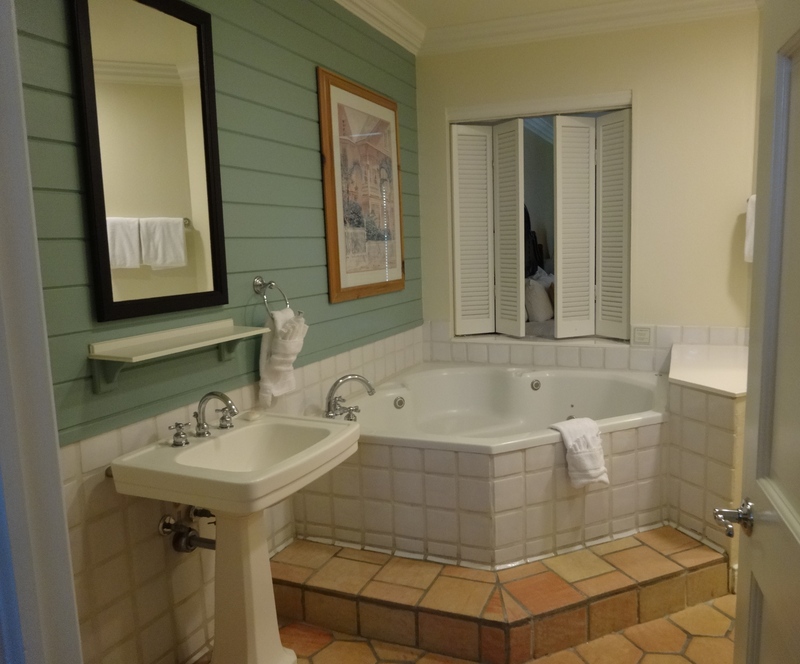 We thought the main pool at OKW was just great! The waterside was so much fun! The pool was nearly deserted when we entered it around 9:30 (there were about 6-7 very pleasant & respectful children with an adult chaperone) and by the time we left at about 10:15, no one was left at the pool. Based on this experience, we are likely to skip fireworks in the future in favor of the pool some nights for sure--especially at BLT or Wilderness this fall. After we returned form the pool, it was time to finish packing . 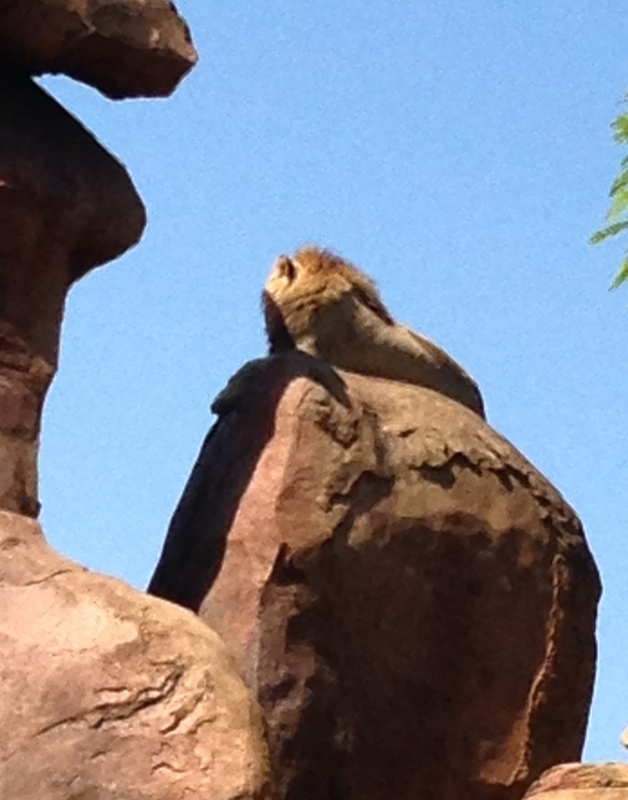 We only had Animal Kingdom left and then the sad flight home. I'm looking forward to trying Garden Grill. I've read recently it hasn't been rotating. Hopefully it will be fixed when I go in October. Dinner at Garden Grill is served family style. The shared plate of three meats and three sides is served to the entire table (just your party, you're not seated together with other parties like at Biergarten). First is a basket of warm rolls with honey butter. 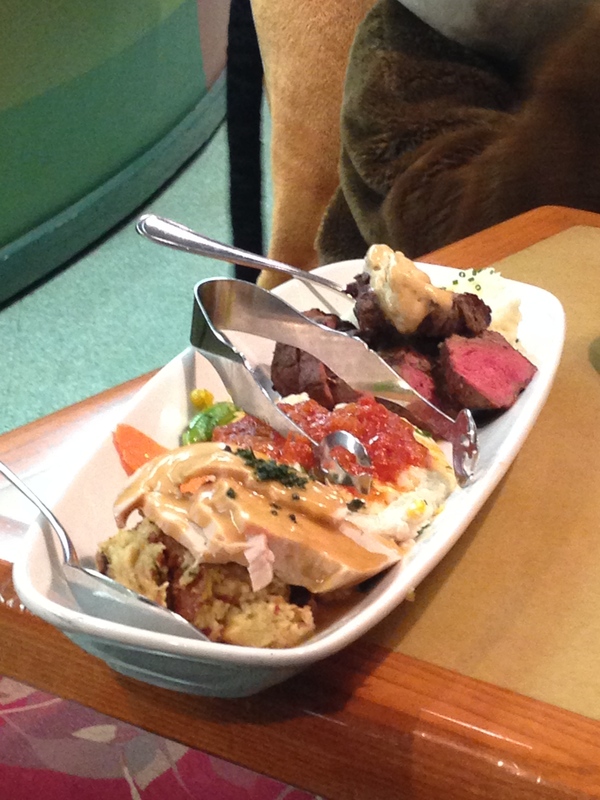 The three entrees are Turkey over stuffing, Fish with tomato "sauce" over vegetables, and beef over mashed potatoes. They bring you one of each on the first plate (although knowing Disney, you could probably request that only one type of entree be served) and you can request unlimited additional courses of whichever entrees and sides that you like. So as long as turkey is close enough to chicken for you, you should be in luck. For dessert, they serve a seasonal berry dish. We've only been here in the spring, so the seasonal berries have been strawberries, blueberries, and raspberries. This is also unlimited. So, the menu is not extensive, but we really enjoy everything that they serve here. My least favorite is probably the beef and my favorite entree is definitely the fish. It has a very mild flavor and with the tomato "sauce", i can't even tell for sure that it's fish. The sugar snap peas and mashed potatoes are my favorites among the side dishes. 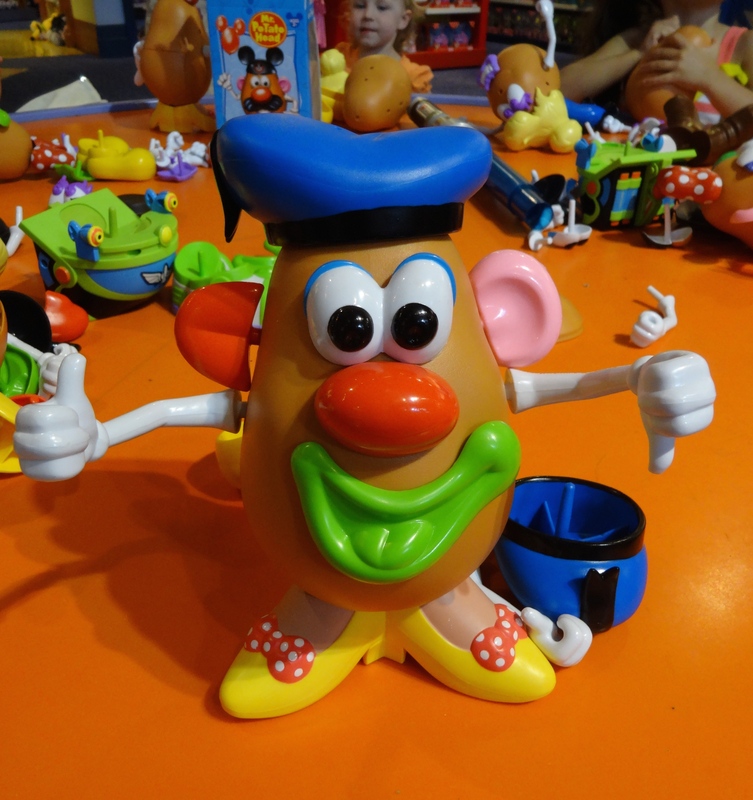 There are no flavors in the lot that are particularly overbearing and the good news is that at around $38pp, it's one of the least expensive character dinners. Only you can know what you'll like and what you won't, but if you can do turkey as a chicken substitute, you may be in luck! Another option might be to call and ask if they have a vegetarian option available--and what it consists of. I'll eat Turkey too, so we may try this restaurant. I'm sure if we asked for the potatoes on the side, or beef well done, etc... that they would be accommodating. It's Disney! Garden Grill is my favourite! 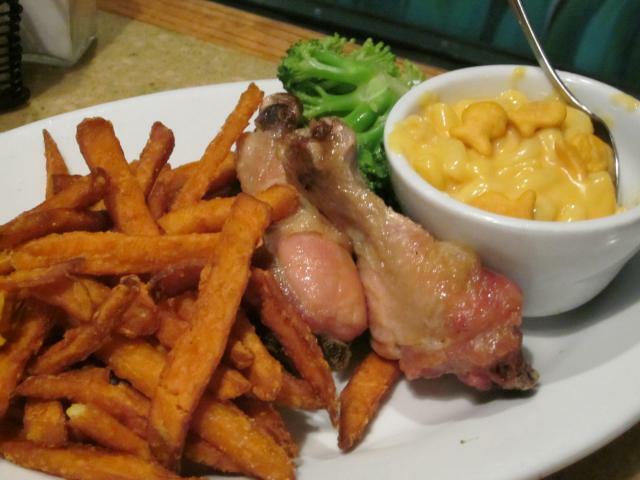 I can't wait to go back in October We're not fish eaters so we just ask the waiter not to put any on the plate and it's no trouble at all When we went last November, they also brought us the kids platter which was chicken drumsticks, mac and cheese and sweet potato fries. Good to know. 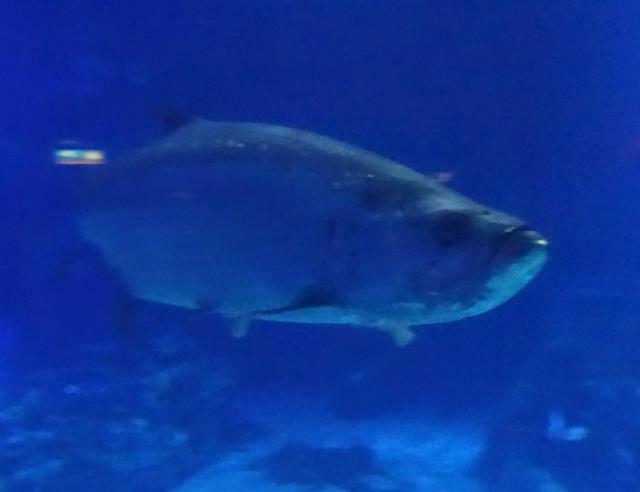 I am not a fish eater either. We saw those sweet potato fries walking past our table and we were a little bummed that they weren't for us!! Great trip report!! Sounds like it was such a great time!! I've never really thought seriously about eating at Garden Grill because nothing sounded particularly appetizing to me, and my sister is pretty much a vegetarian so I knew it may be a problem for her. BUT I heard recently from some vegetarians that there is a vegetarian option available upon request, and they absolutely loved the offerings so now I'm considering it a little more. 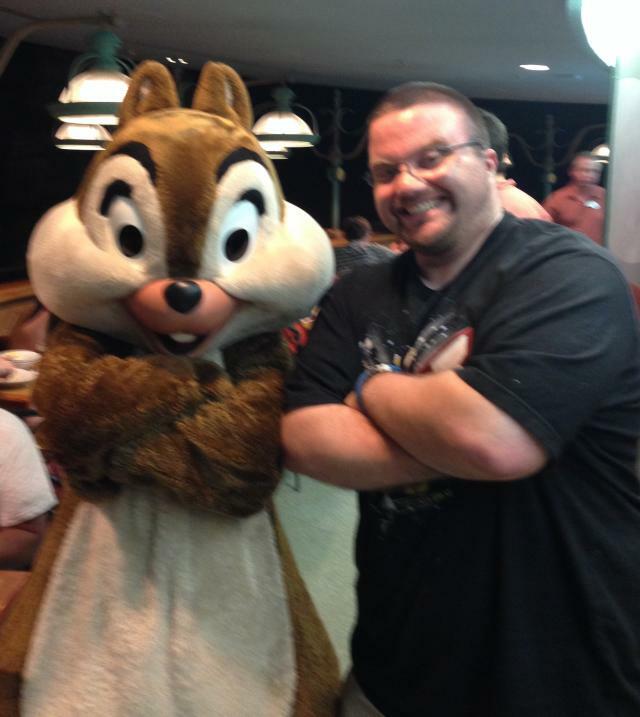 Chip and Dale are my favorites so a character dining experience with them would be amazing for me, haha. Chip & Dale really are great! I would be curious about what the vegetarian option entails. Will you share with us if you find out? Usually this park is an afterthought for us and I've never been able to keep Benn entertained here long enough to get to see the parade. 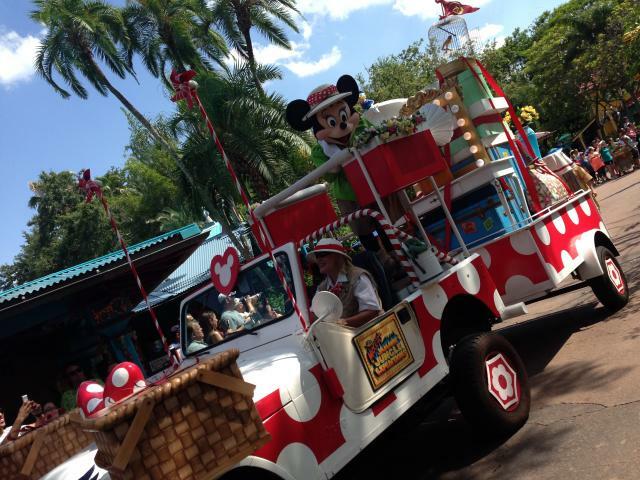 That was a huge goal for today because the next time we return, Mickey's Jammin' Jungle Parade will be gone forever. Once again, we missed rope drop, but today was understandable because we had to pack up the remaining items and deal with checking in all of the bags at the appropriate places. There was also the requisite stop at the OKW shop in the morning because a CM had told me the previous day that they would be getting a shipment at 5am and there was a small chance that frozen merchandise (including the new Olaf pin!!) would be arriving. Unfortunately, there was no Frozen merchandise in the shipment, so I still don't have the Olaf pin, but I'm sure the supply of that pin will exceed the demand by the time we arrive in September. 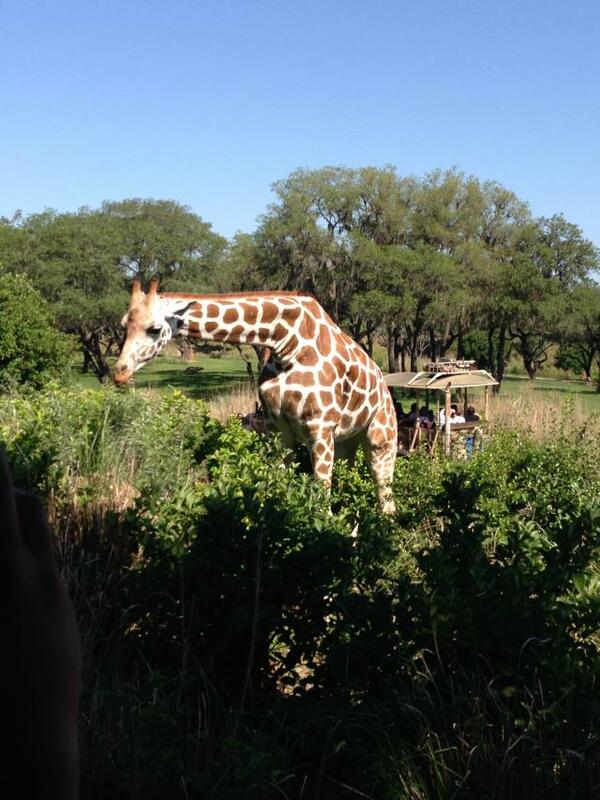 After Dinoland, we headed to Africa for Kilmanjaro Safaris. This is one of the few attractions that we found where you loose a bit of time if you are traveling with a wheelchair of ECV. There is only one loading platform for handicapped guests and unlike the stand load/unload process where you board at one station and disembark at another station, you have to wait to travel all the way back to the loading platform to unload. The silver lining here is that there is a delightful little display (pictured below) in the side of one of the walls that you can only see if you're riding in the accessible ride vehicle. Also, once you get off the truck, the walkway back to the main area is much shorter from the accessible loading dock than it is from the other unloading areas. As for the safari itself, we got some good giraffe shots, but there wasn't anything else that was "standout" about the other animals. (No elephant's taking a dump this time! ) The crocodiles were back (missing in April). Our driver, Joe, was very informative and we very much enjoyed him. After the safari, the boys hustled over to EE to use their FP (before lunch...haha) while aunt and I trekked through the Pangani Forest. The gorillas were a little sleepy today, but we very much enjoyed the birds. Benn and cousin loved EE. I don't know that Benn would do it more than once per trip, but I'm glad that he finally got to try it. He didn't want to go alone and I just couldn't make myself do it! We all arrived back at Flame Tree within minutes of each other. I got my usual half chicken and Benn got his usual 1/2 slab of ribs. We keep saying that we're going to split the combo, but no one wants to give up their beans or coleslaw. You may be aware that the little picnic areas for Flame Tree are themed for various animals. Well, the cruel, cruel designers have themed one after the vile, legless reptiles and which one did my dear, dear husband accidentally choose? You guessed it. We ate lunch in the snake house. Everything was great until we started looking around and talking about all of the great details--like the snake that was eating a mouse as the carvings that frame the pavilion that we were sitting in. Ew, ew, ick, gross!! After that little mini trauma, we hit Tough to Be a Bug. This was another first for us, but given aunt's career as bug tender, it was a must-see. The queue was very long (not the line, the distance that we had to travel to get down under the tree) and it was a difficult place to maneuver the chair. The theater had the poorest handicapped accessibility of the trip. There are a lot of poles (presumably rather important for the structural integrity of the Tree of Life), but they made navigating in the dark theater quite a challenge and relative to other shows, it felt like a very short amount of time to get inside, find a spot, and get situated before the show was up and running. The show was largely cute. I could have done without the stink bug, but there was way less "gross-out" factor than I had expected. It was nice and I'm glad that I've seen it. I would go again, but it's not something that will go on the "can't miss" list. I thought it ended rather abruptly without really telling a cohesive story. Next we made the long trek over to Finding Nemo. The handicapped seating area here is splendid. It's right behind the aisle in the center of the theater, so I felt much more engulfed in the show than last time when we sat in the very back. I did still manage to doze off for a minute though. Oops. There was something magical about this show the first time I saw it, but it just doesn't quite have the same quality for me anymore. Maybe because I've now seen Festival of the Lion King and I like it SO much better?? The next very important stop was for ice cream on our way to Flights of Wonder. Yet again, another show that we had not previously experienced and we all thought that it was quite good! We missed the first few minutes because we had waited for the theater to empty after Nemo rather than be restricted and running over people on the way out. By the time we got our ice cream and stopped for an all important restroom break, we were cutting it close for the show! 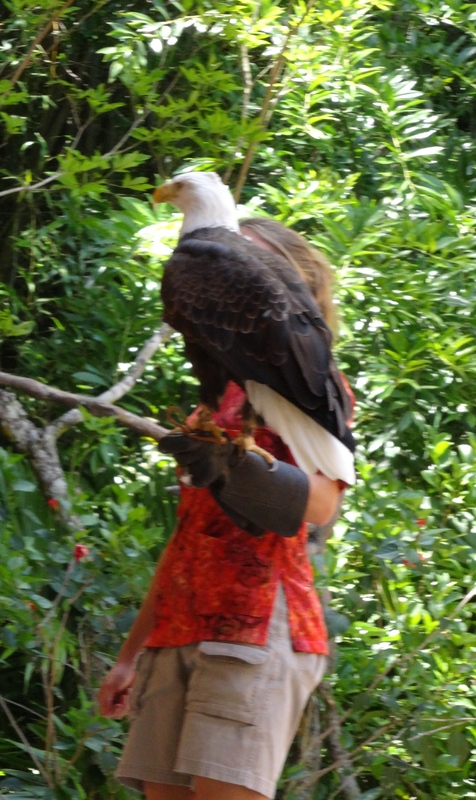 Those birds were really amazing! 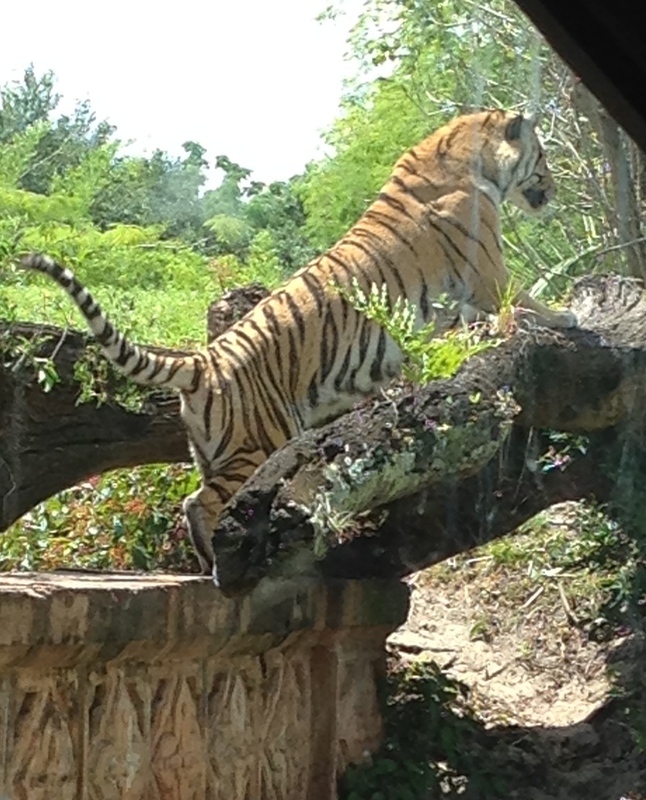 Our last actual attraction was the Maharajah Jungle Trek to see the "kitties". The tigers were pretty active today, so that was very enjoyable for us. After the Tiger Trek, we grabbed a spot for Mickey's Jammin' Jungle Parade. I wandered over to a group of CM's with pins and traded with them and then I started talking to this kid, Derrick. He's only been with WDW for 18 months and at 19-years-old, he's already in a training position. He was very interesting to talk with and I hope he continues to be successful because he really epitomizes the enthusiasm that a cast member should have for the job. We probably talked for 20 minutes or more. As the parade was getting ready to start, I rejoined the family and we watched out one and only Jammin' Jungle Parade. I really enjoyed all of the details on the characters' vehicles, but in total, I'm not broken up that it's going away/being replaced(?). Just before the parade started, I received a call from Walker mobility about making arrangements to pick up the chair. All I had to do was call them after the parade was over and they met us 5 minutes later in the AK parking lot! 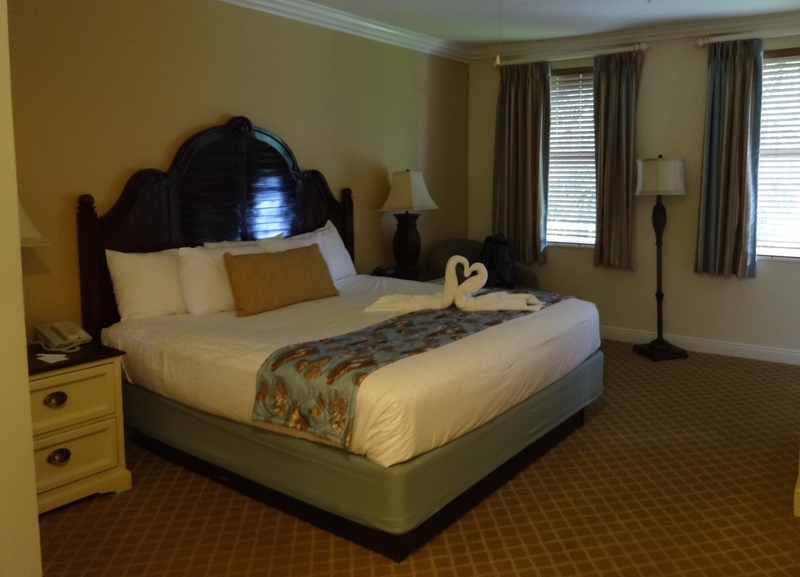 If we had packed our carry-on bags in the car, we wouldn't have even had to stop back at OKW before going to the airport! I think I mentioned it in the first post that they were just fabulously easy to deal with. When we got home, I received a thank you email and a thank you card in the mail from them. They responded promptly to the questions that I had prior to receiving the chair and they were really excellent about working on our time schedule. We stopped back at OKW to pick-up our bags and headed for the airport. 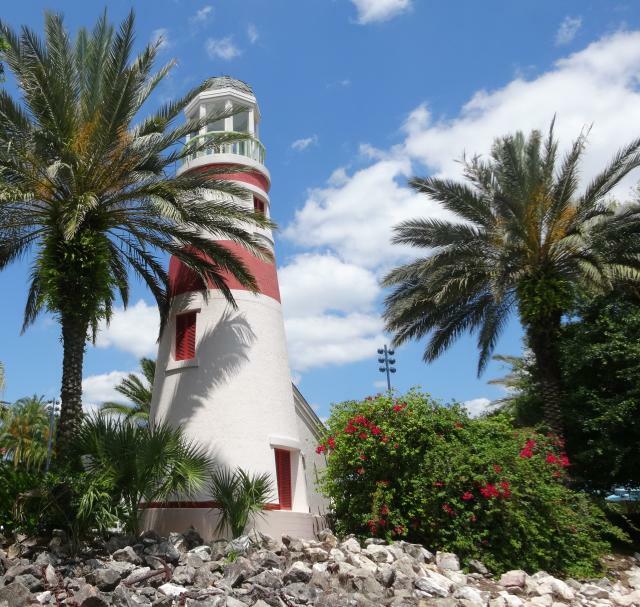 We wanted to allow plenty of time because when we drove back to the airport on our December trip, we hit massive amounts of traffic on I-4 and ended up diverting onto some side street and winding through town. It took us over an hour to get from MK to the airport that day and I was afraid that we weren't going to make our flight. As is turned out, we had time to grab dinner before the plane started boarding, but it was definitely too close for comfort! This time, we paid the extra $1.25 in tolls each way and took Rt. 528 to and from the airport instead of staying on I-4 all the way to that one road that runs directly north to south between the airport and Orlando---I think it's Seminole Parkway or something like that. I think it only took us 25 minutes from OKW to MCO. Since I prepaid the ridiculous price for pre-aid fuel, our rental car drop off took about 2 minutes. We had checked our bags at OKW and printed our boarding passes, so we just walked straight to security. Aunt had TSA pre-check status and the line was moving so efficiently that with the extra time it takes her to get through with her knee replacements, we actually beat her through the line. We had dinner at whatever the burger joint is called in the Southwest Terminal (sounds like Johnny Rockets, but that's not quite the right name). The food was really good, but that place was RIDICULOUSLY crowded. Take a note, MCO, your customers are rejecting mcdonalds, au bon pain, and sbarro. They are not delicious. We want better food. We had a bit of a wait, but it wasn't too bad. The flight home was miserable. We had turbulence most of the way home. I feel like we've hit more turbulence flying southwest than we've ever hit with AirTran of Jet Blue. We don't fly much and we've only ever flown to and from Orlando. Has anyone else noticed more turbulence lately or more/less based on what airline you're flying? I don't care about the motion, but every time we hit a bump, my brain screams, "oh my god we're going to crash and die!" Two hours of these little mini panic attacks is exhausting. Oh and I saw an article on my friend's FB page the night before we flew about a near miss between two planes over the Pacific ocean and it was a flight that my friend (a flight attendant) had flown the previous week! Add to it, I usually sit in the window seat because I feel better looking a the world outside than I do focusing on how small the inside of the plane is. That works great except when Benn is in the center seat and aunt is in the aisle seat and I can barely move in my seat without hitting something. I made it about half way through before I started panicking and had to get up--seatbelt sign or no seatbelt sign. Fortunately, 2 hours later, we were home again. I really want to go to Disneyland, Aulani, and DLP and maybe even Tokyo Disney someday, but I have no idea how I'll mentally survive those flights. I feel like the ends of my nerves are frayed by the time the plane is back on the ground! Of course, I didn't expect to ever fly. Period. So maybe there's hope! 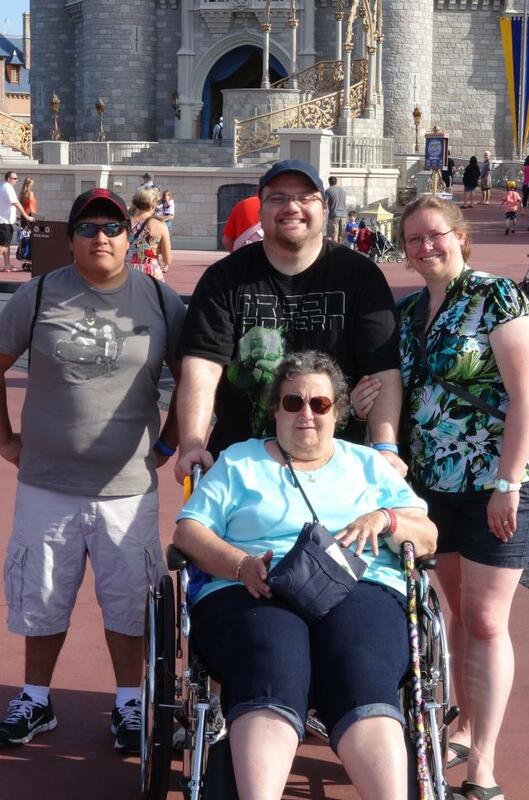 I just have to reiterate how astounded and impressed I was with the service by all of the cast members in helping aunt to have a great vacation and in helping her to get on and off of rides with ease and dignity. 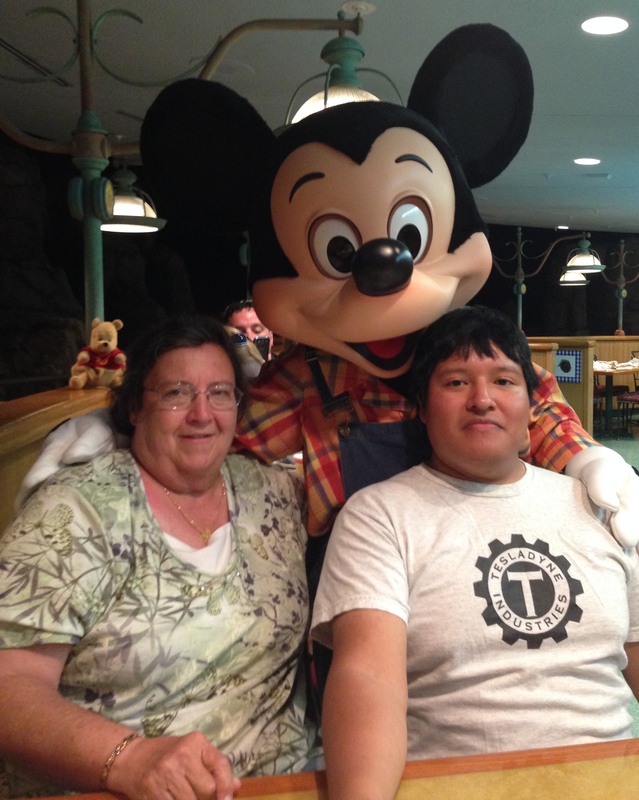 I've witnessed cast members assisting guests with disabilities before, but getting to see them in action with someone who was in my party--words cannot express how grateful I am for the fantastic service that these wonderful people provide. 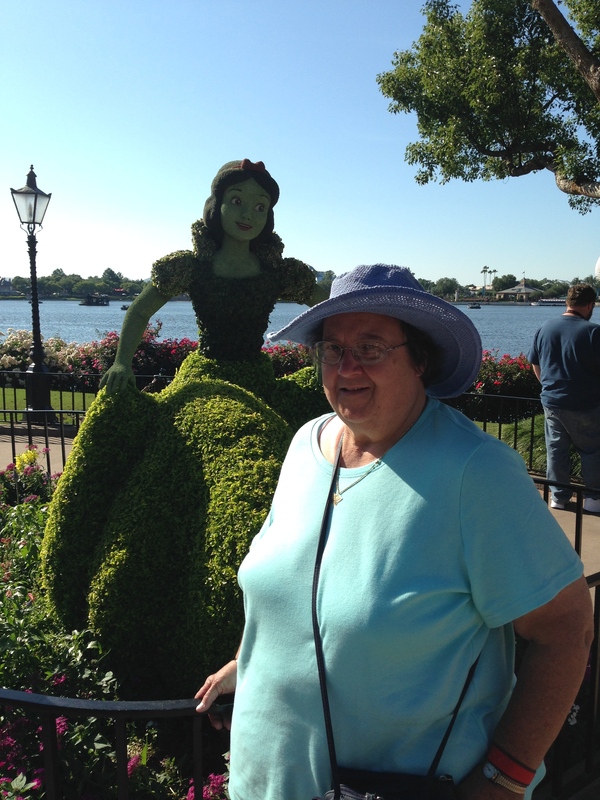 This was most likely her last trip to WDW. She has resigned herself to the fact that her mobility is declining and she is becoming less comfortable being away from home as she grows older. She has been a Disney fan for her entire life. Benn was like a son to her when he was growing up and for us to get to share this time with her was really special to all of us.